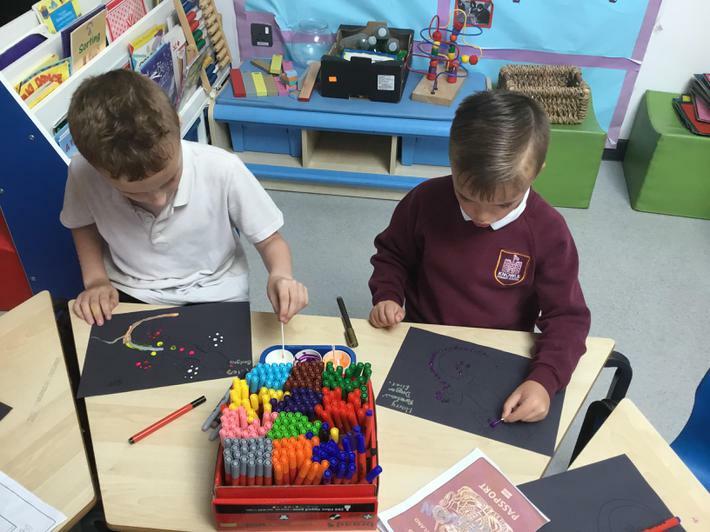 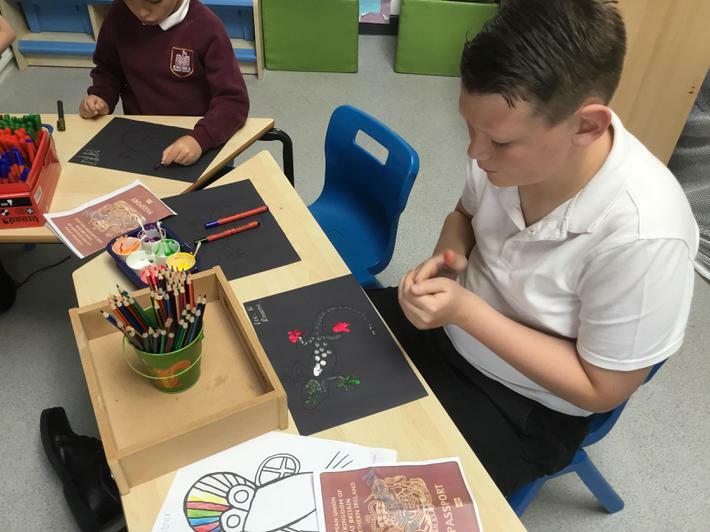 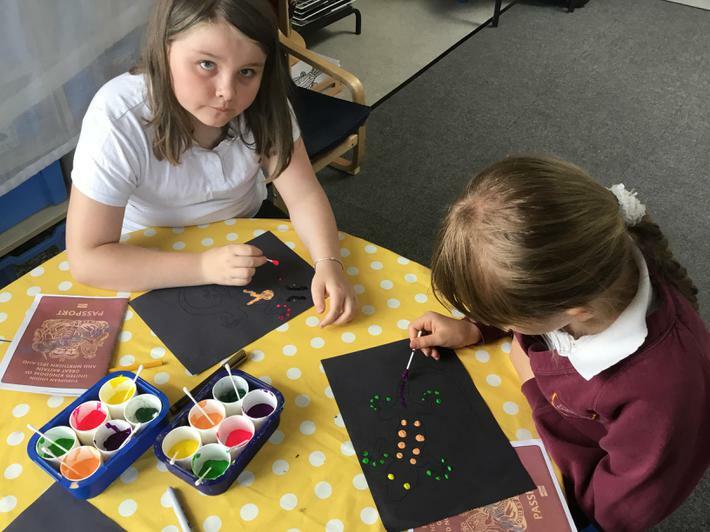 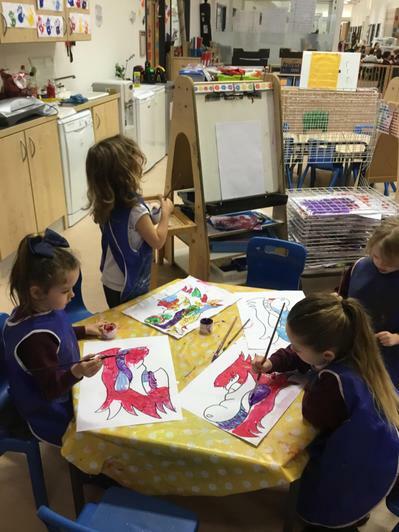 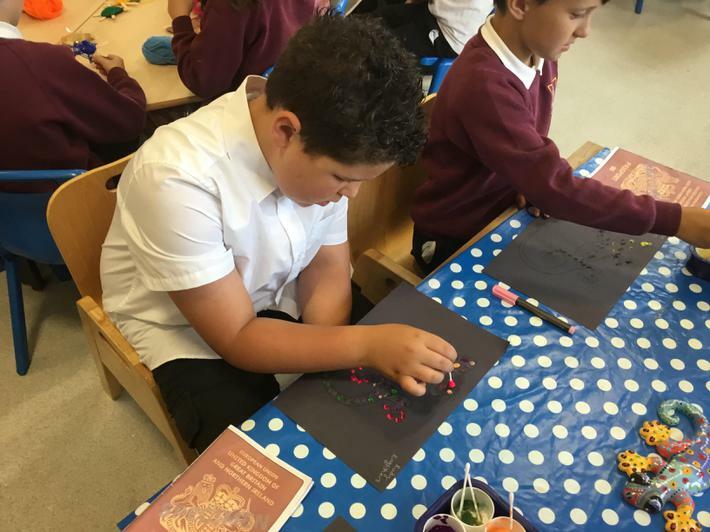 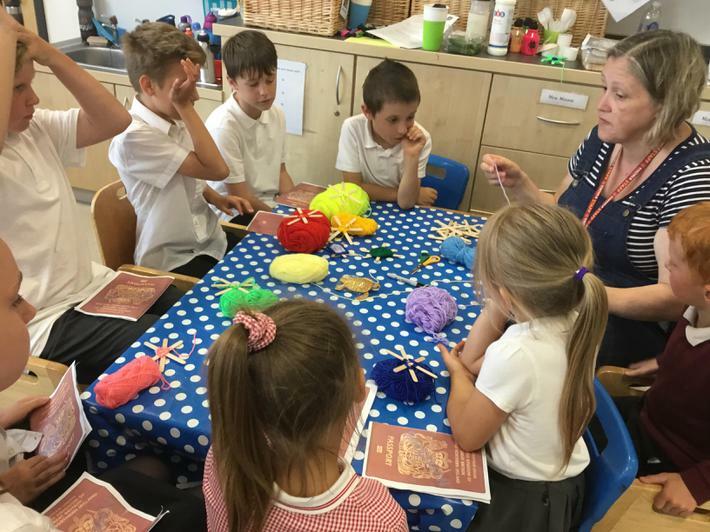 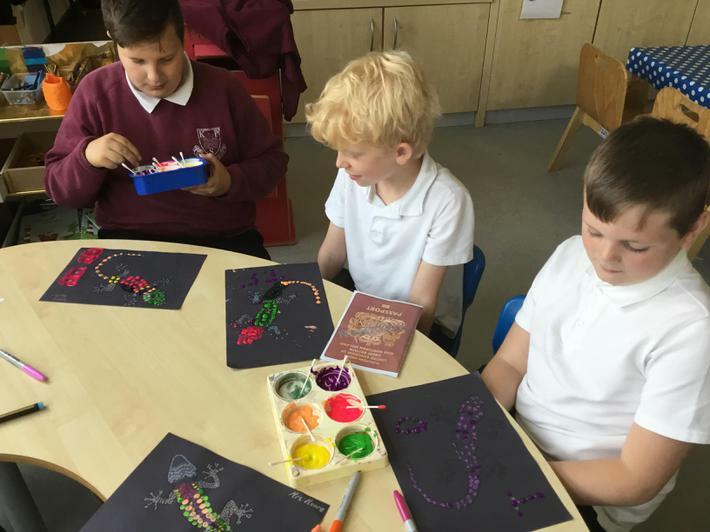 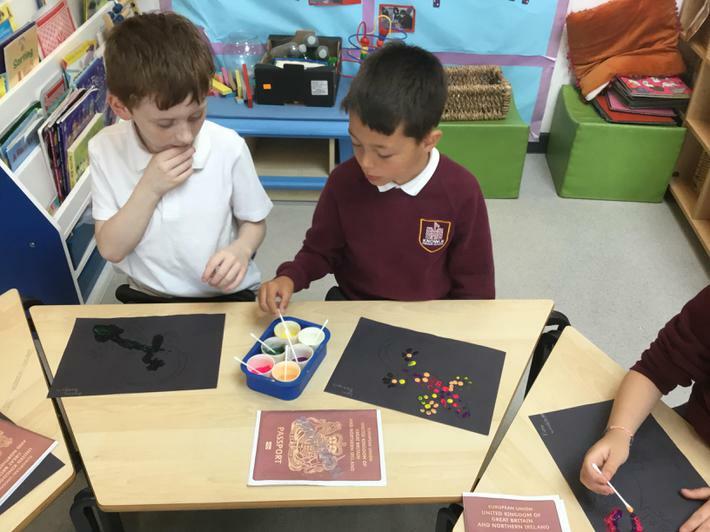 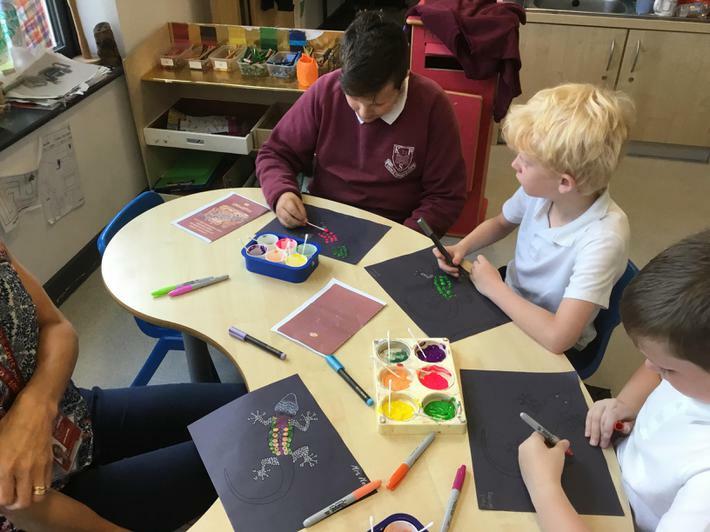 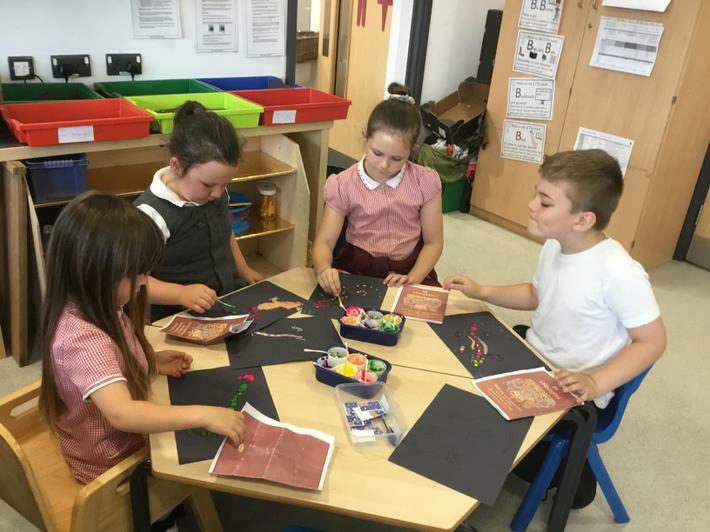 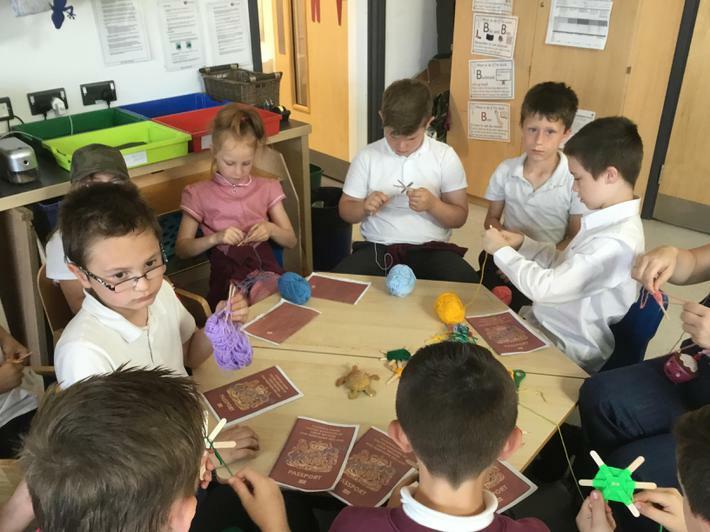 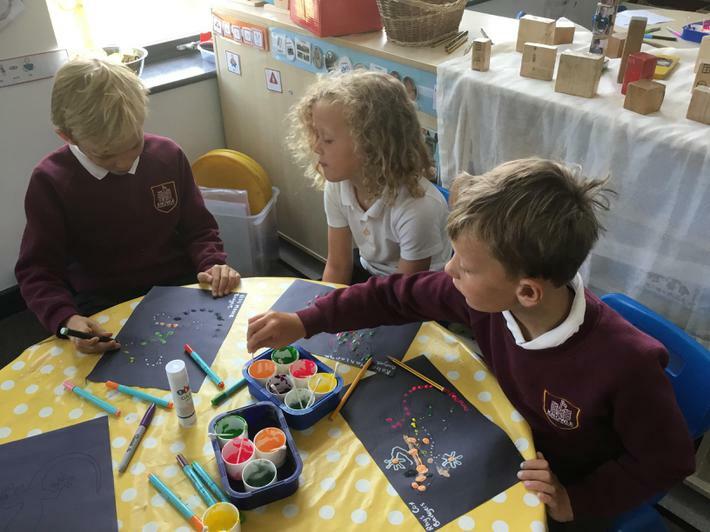 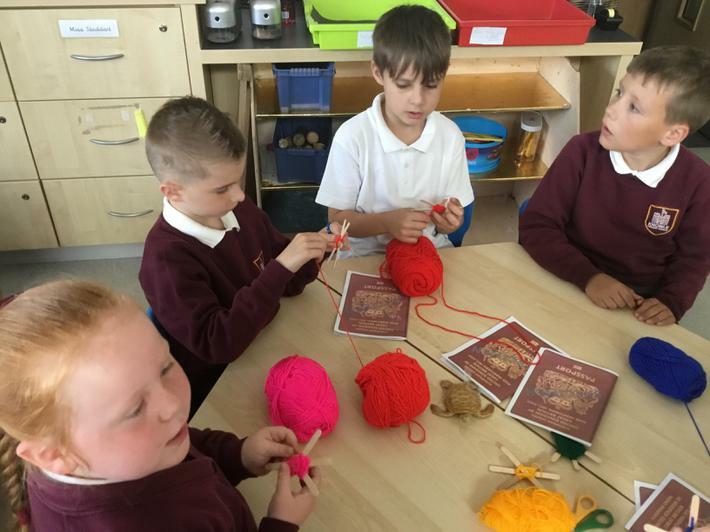 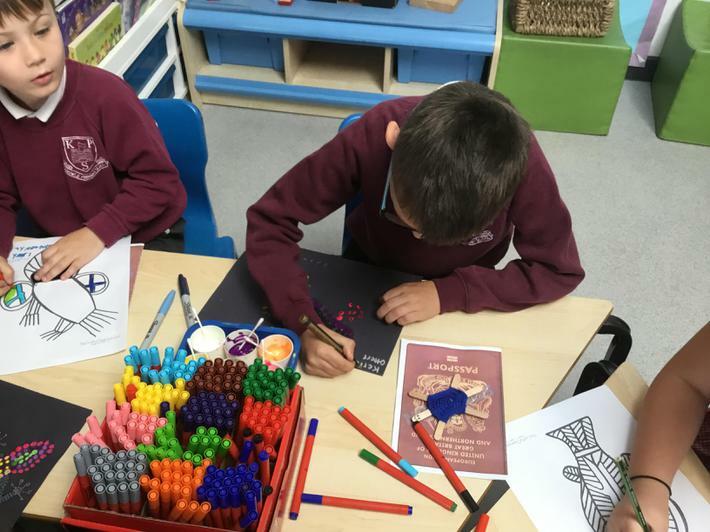 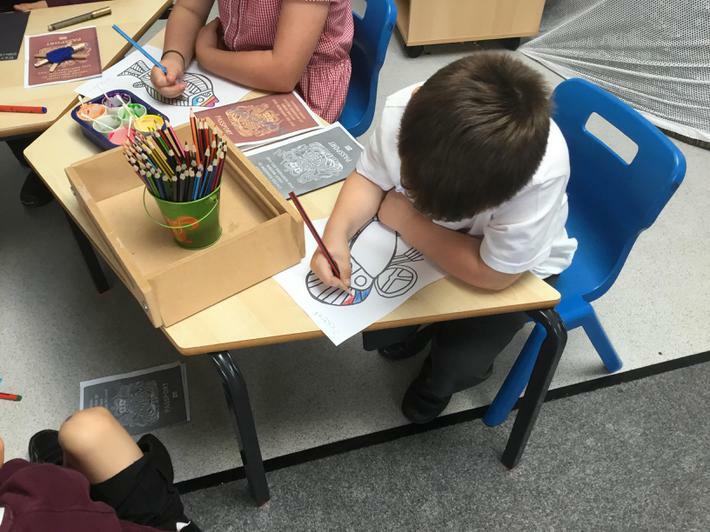 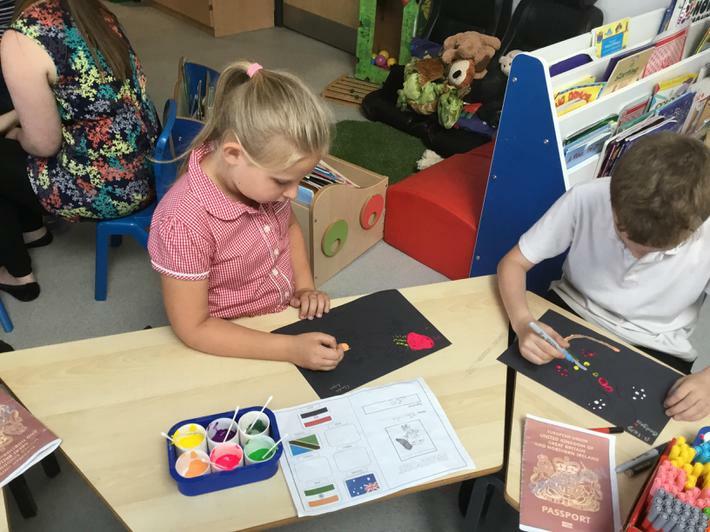 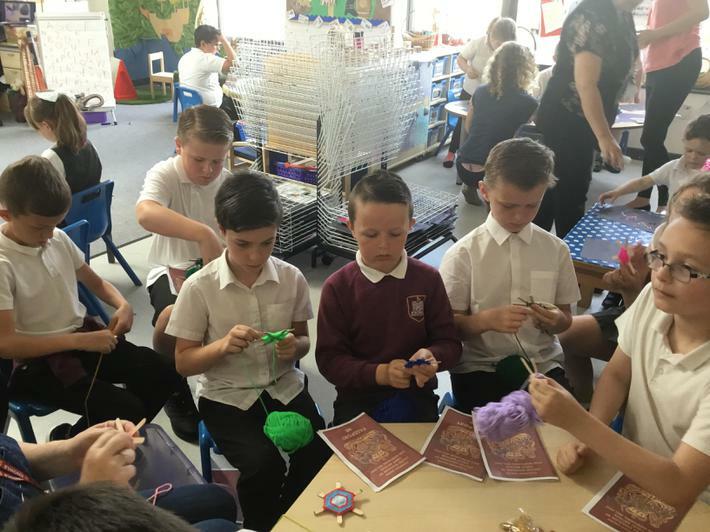 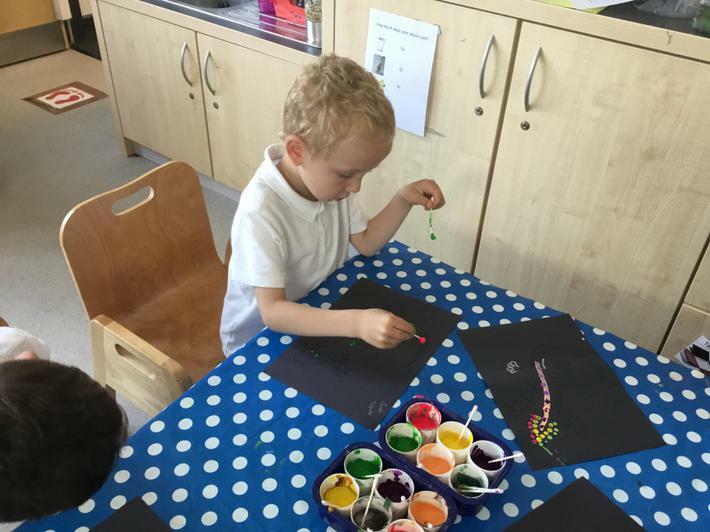 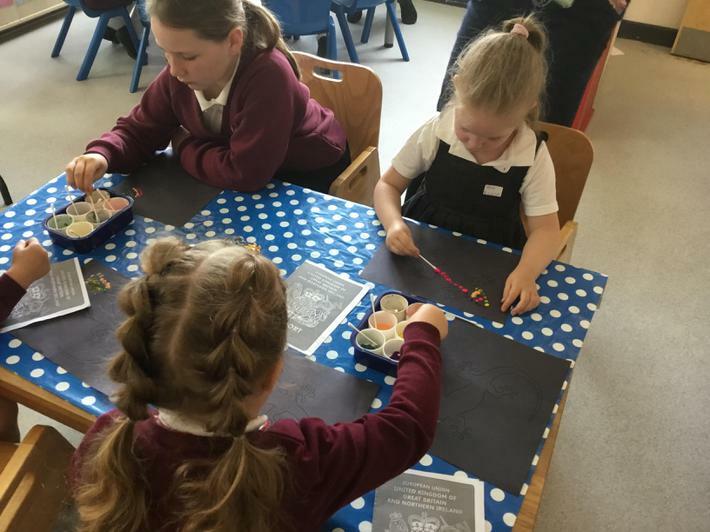 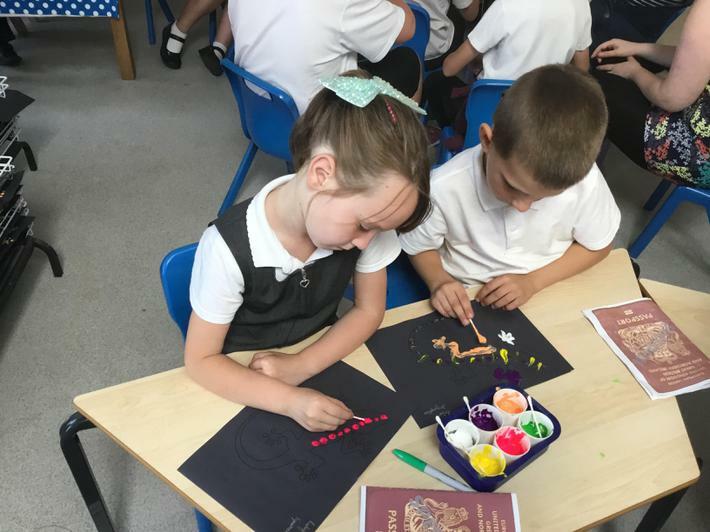 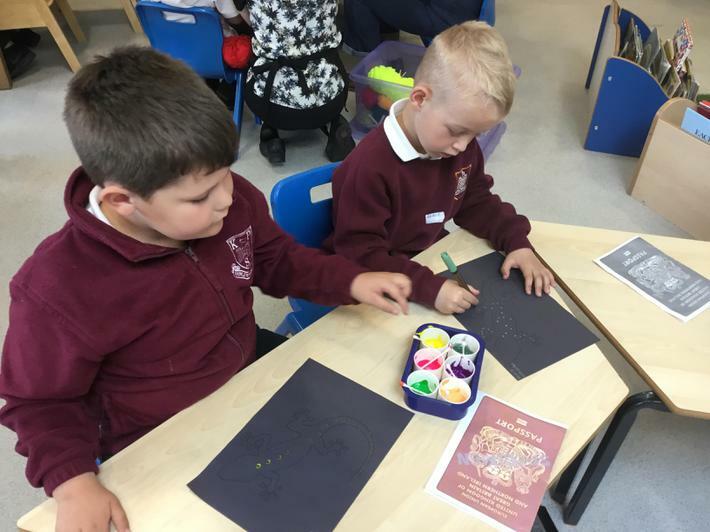 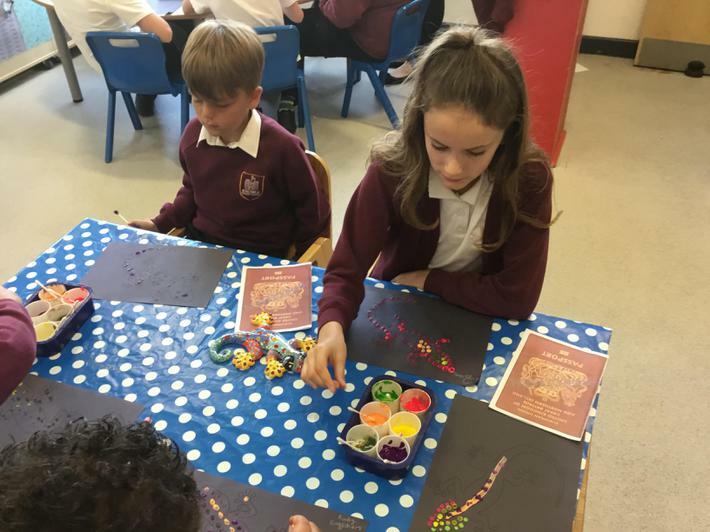 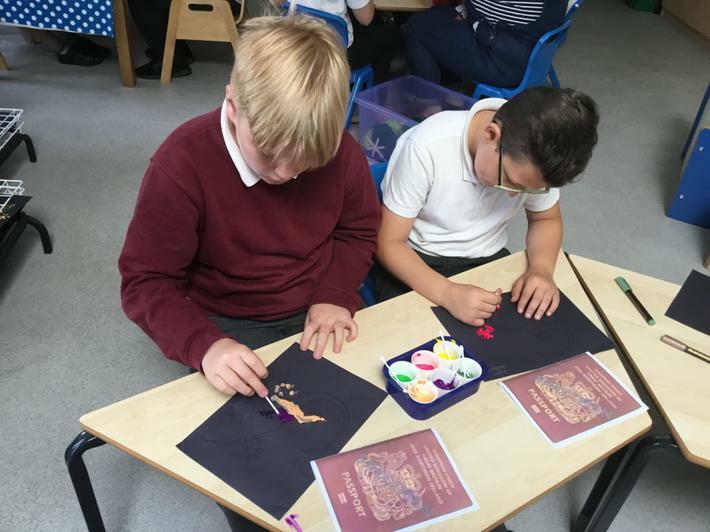 In Caterpillar class, we have been finding out about Chinese New Year. 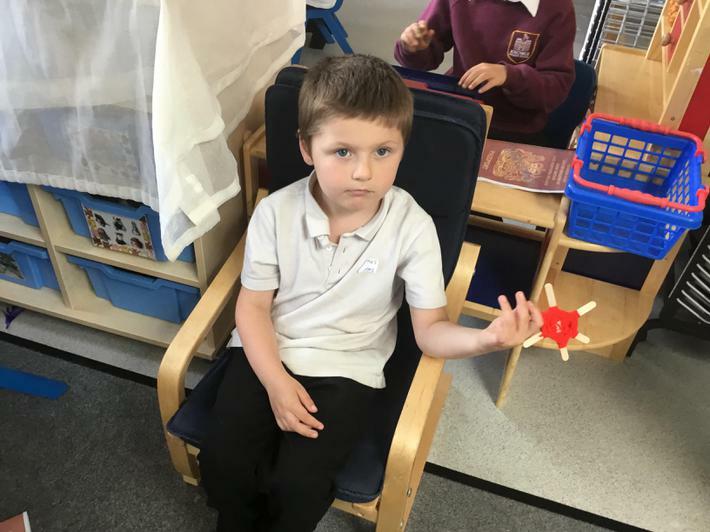 We learnt that this is the year of the pig. 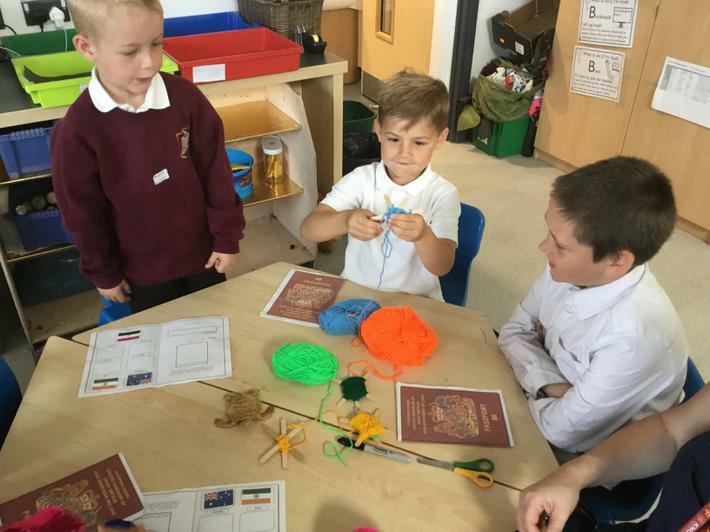 We also learnt all about why people celebrate new year and the traditions that are followed. 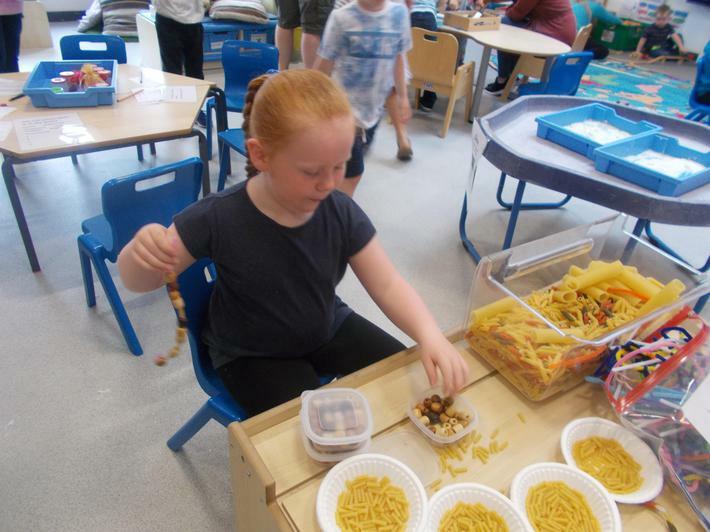 Also, we were lucky enough to try some yummy Chinese food. 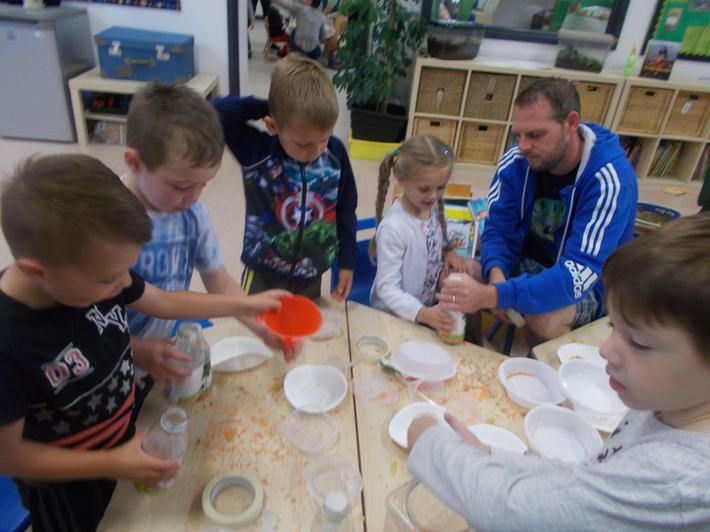 We tried, spring rolls, noodles, egg fried rice and even some soy sauce. 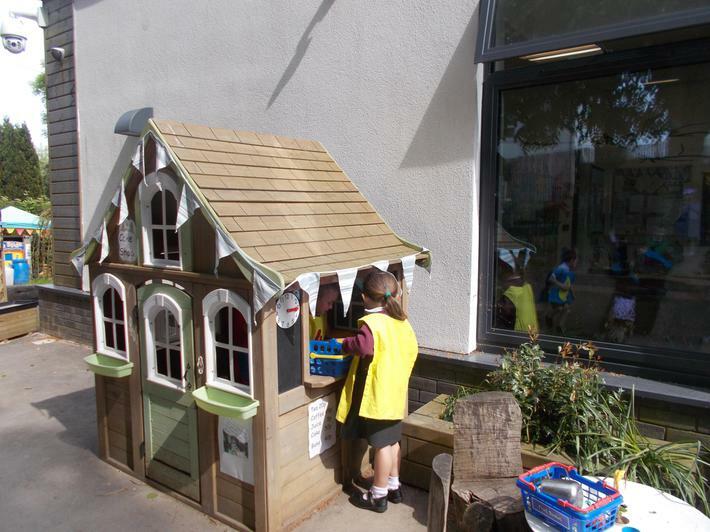 Useful sites Read with phonics. 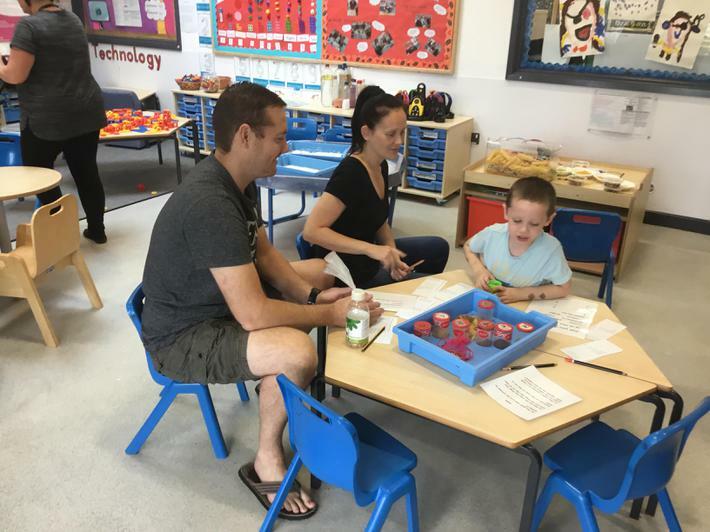 This is a great site for you to use at home with your children which allows them to practise their oral blending. 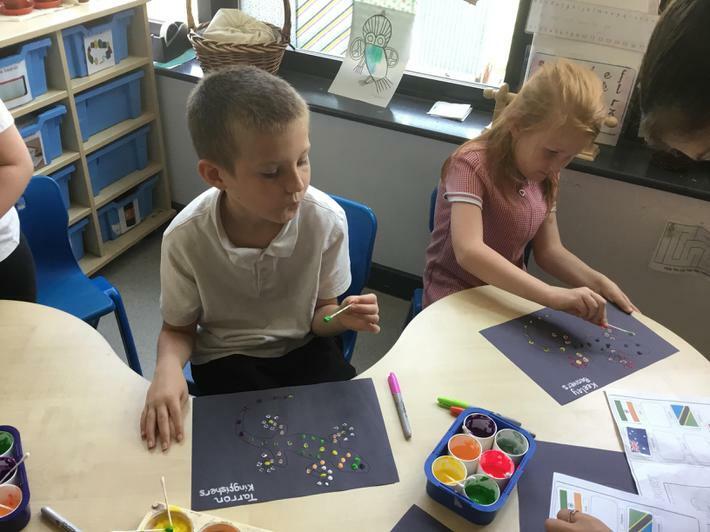 We have been learning to count. 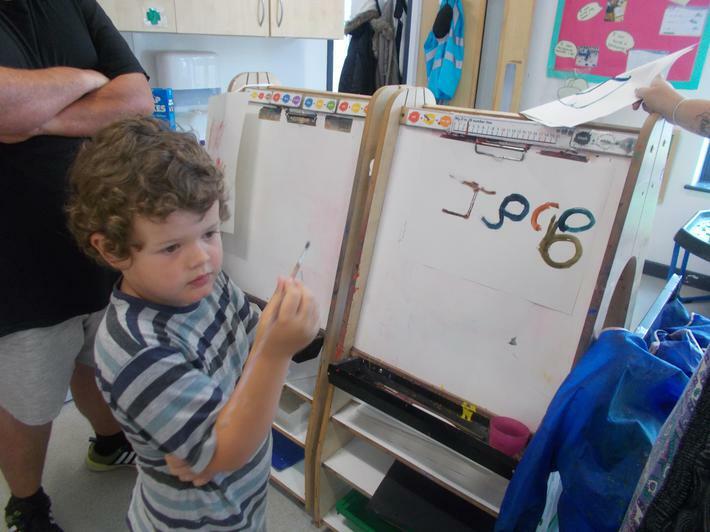 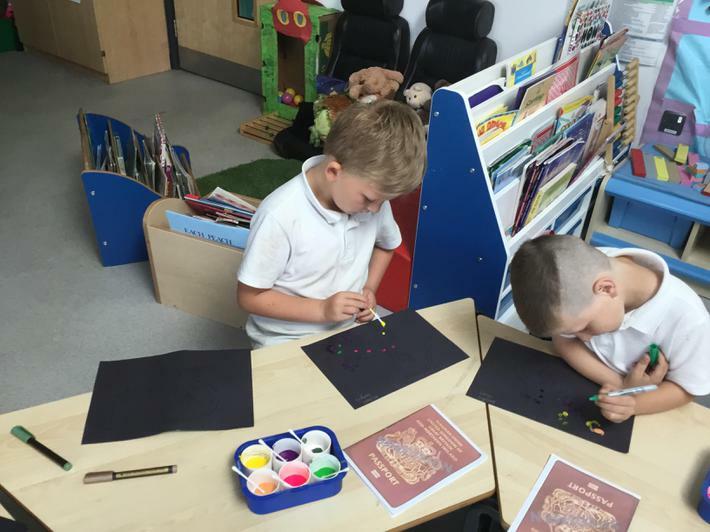 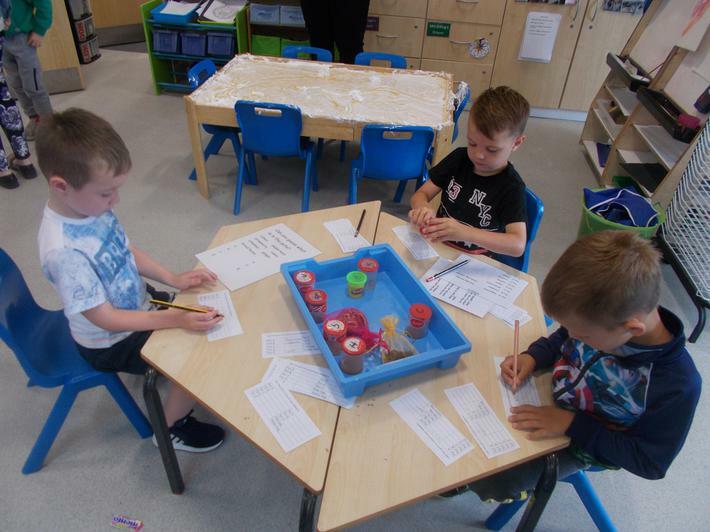 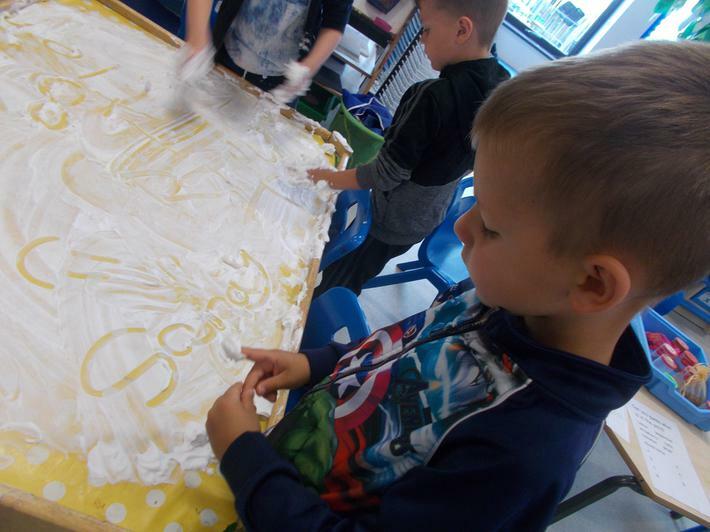 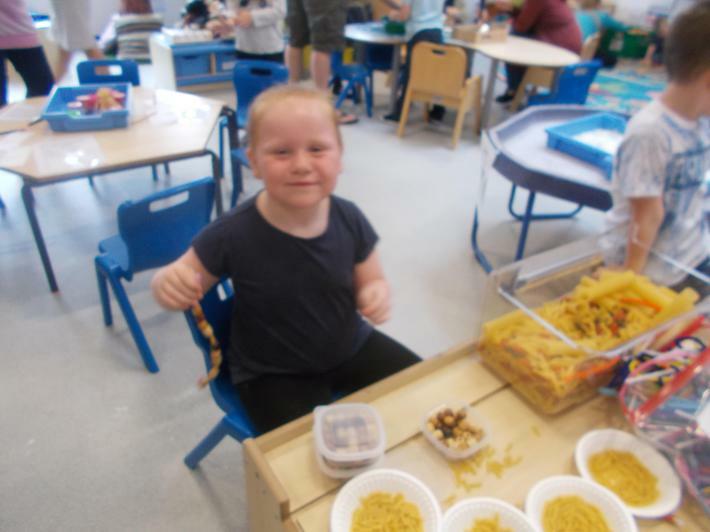 In Caterpillar class we have been learning to count to 10 and beyond. 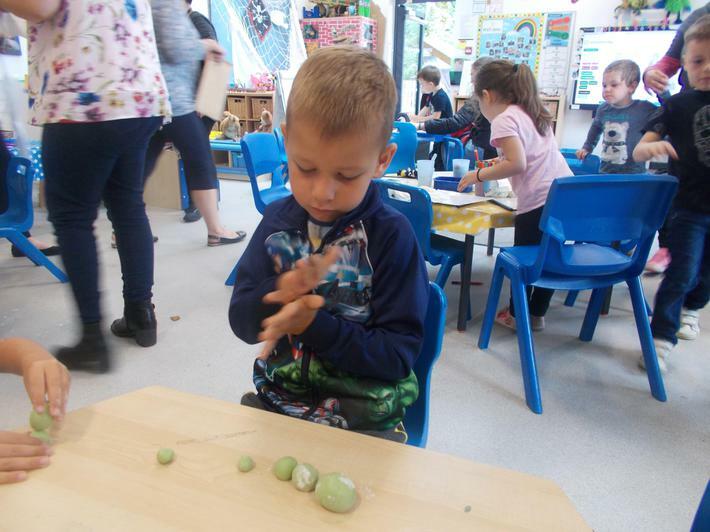 We can now count up to 20 orally and we are great at counting objects that do not move. 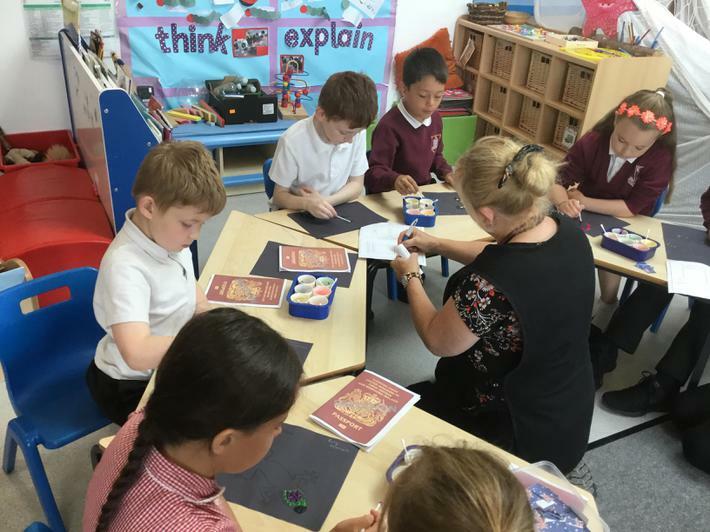 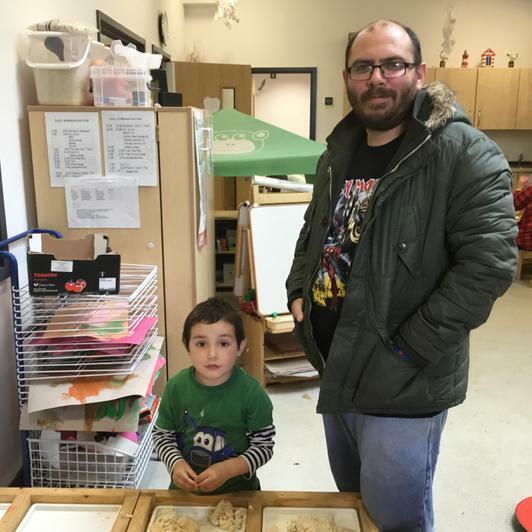 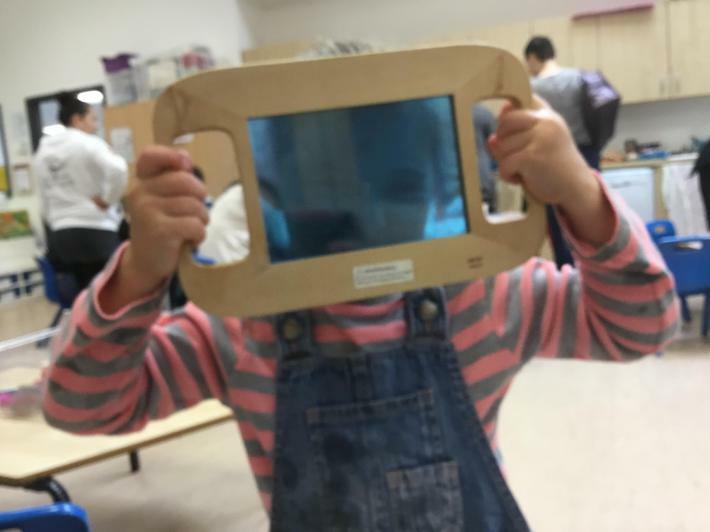 This term, one of the things we are learning to do is to find one more and one less of a number and we are doing really well. 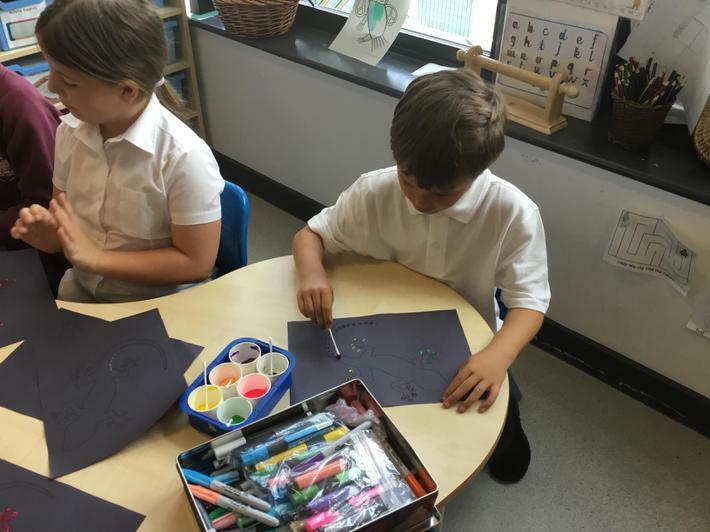 Some of us are even able to order numbers beyond 10 now. 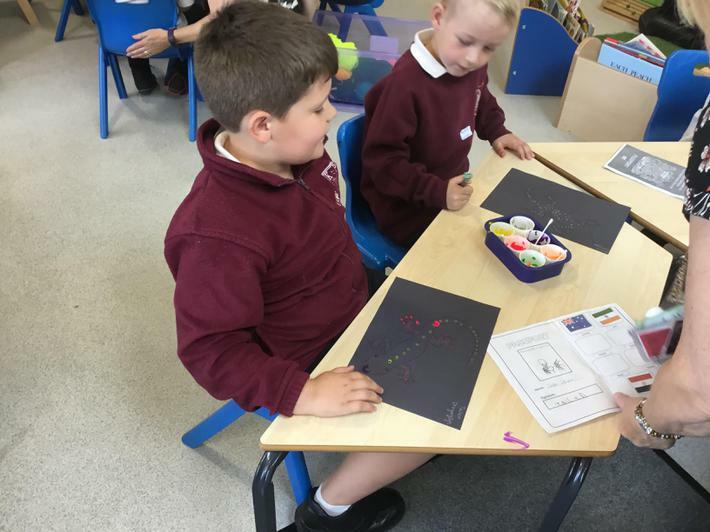 Make sure you ask us at home and we can show you how clever we are. 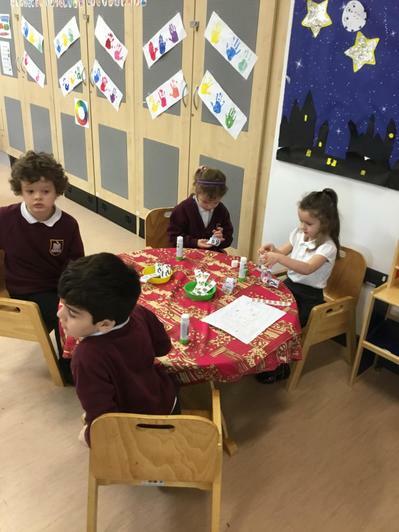 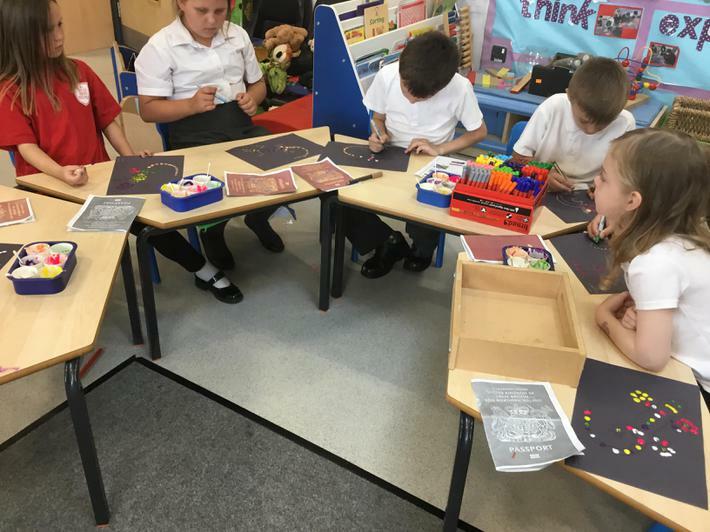 We made Christmas cards for our families in Caterpillar class. 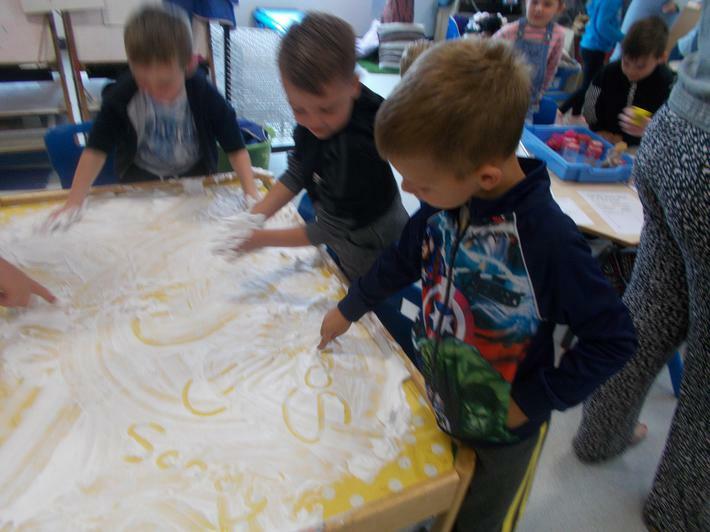 We wrote out names on them. 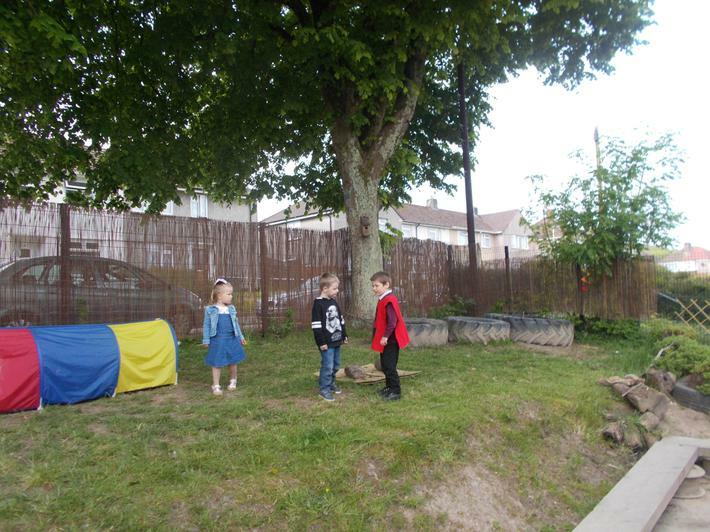 Rufio and Isla came to visit! 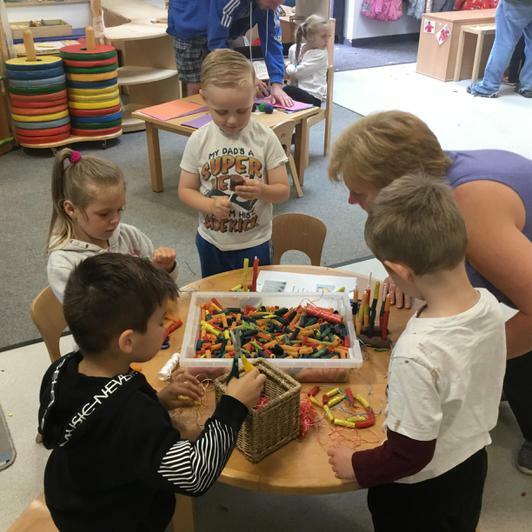 Every child matters, every moment counts. 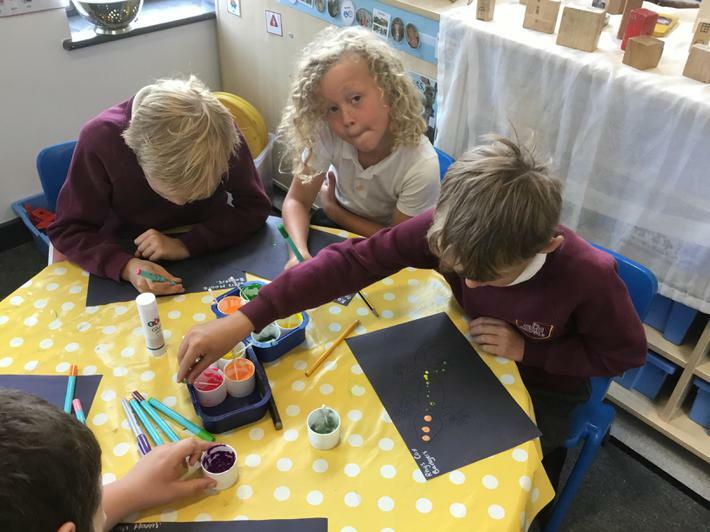 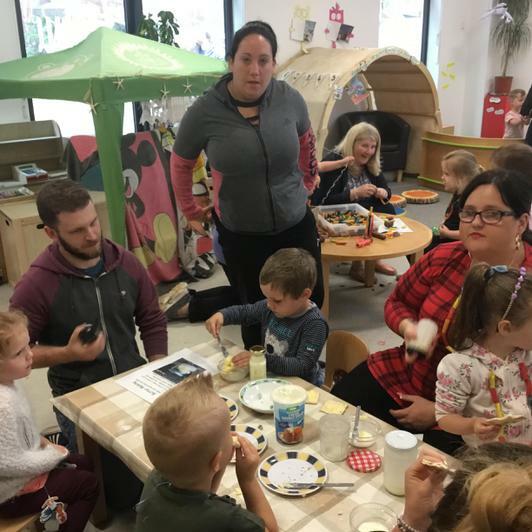 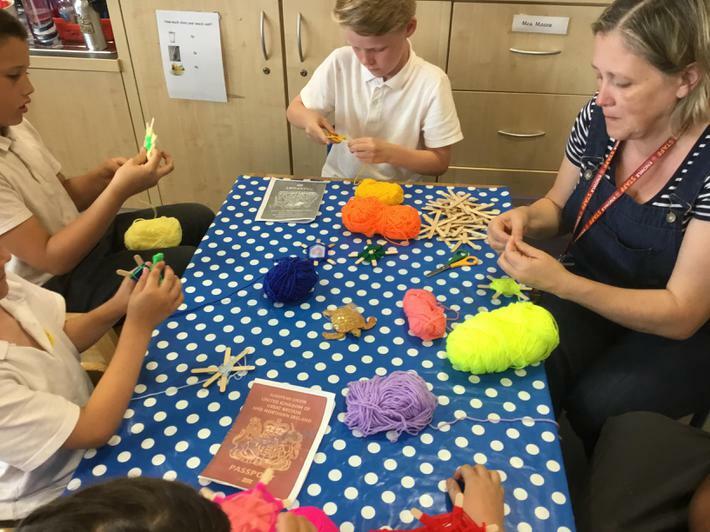 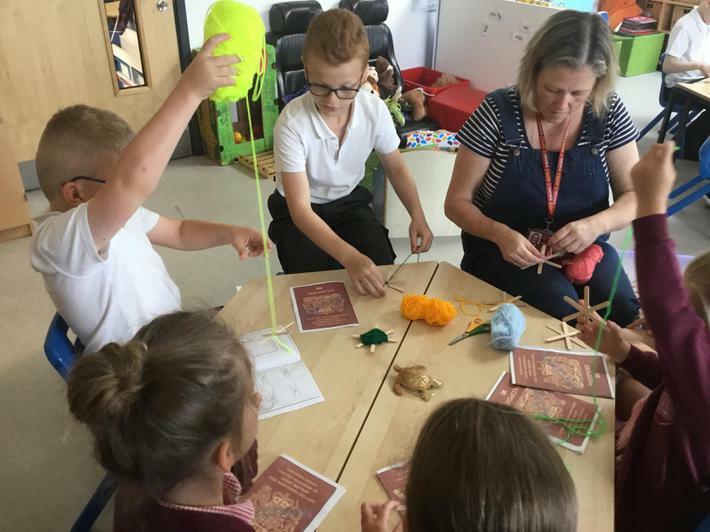 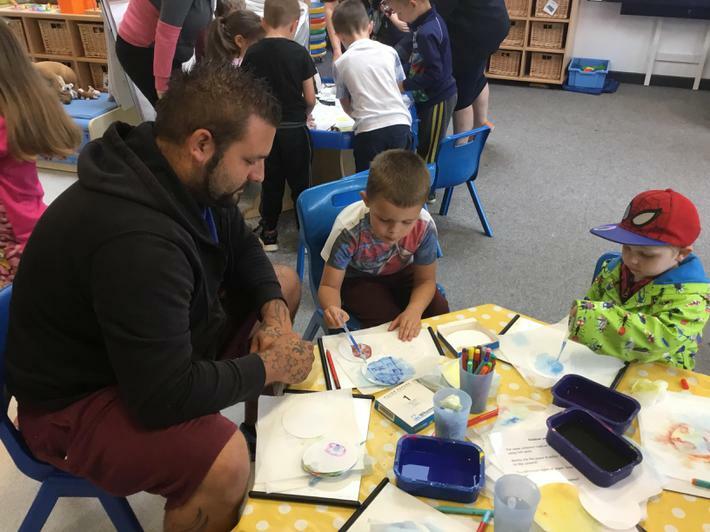 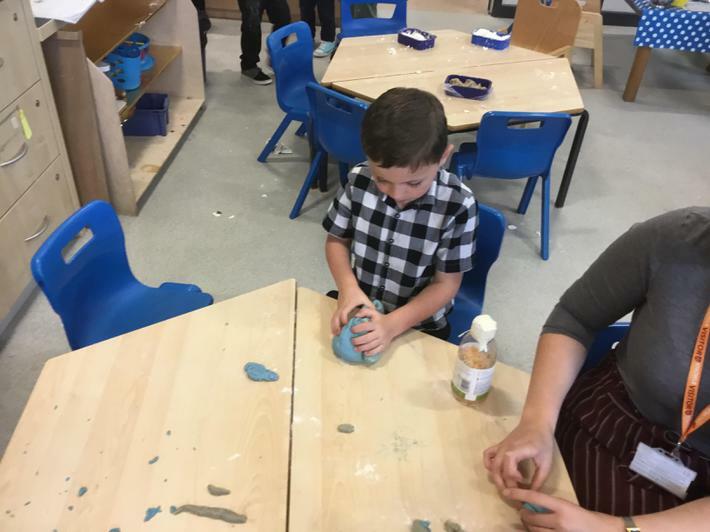 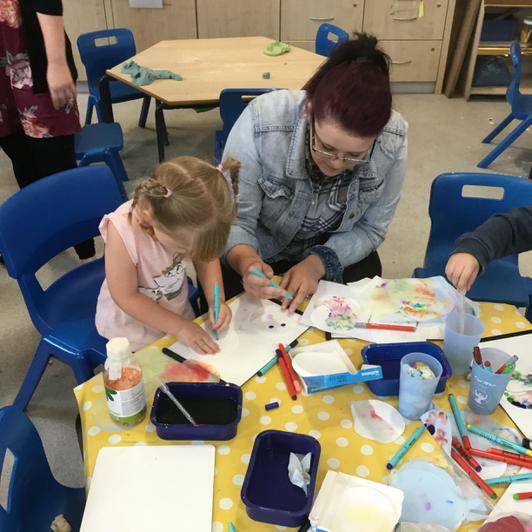 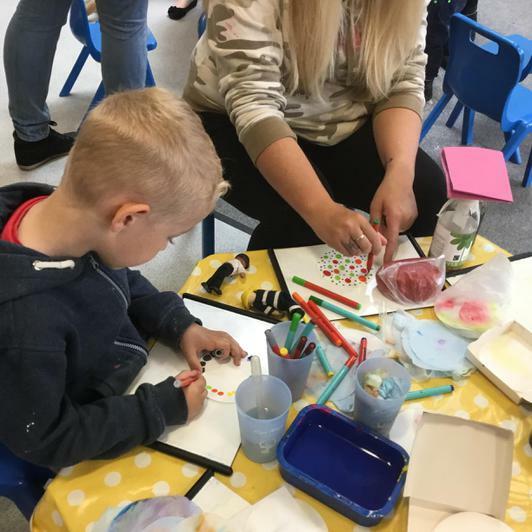 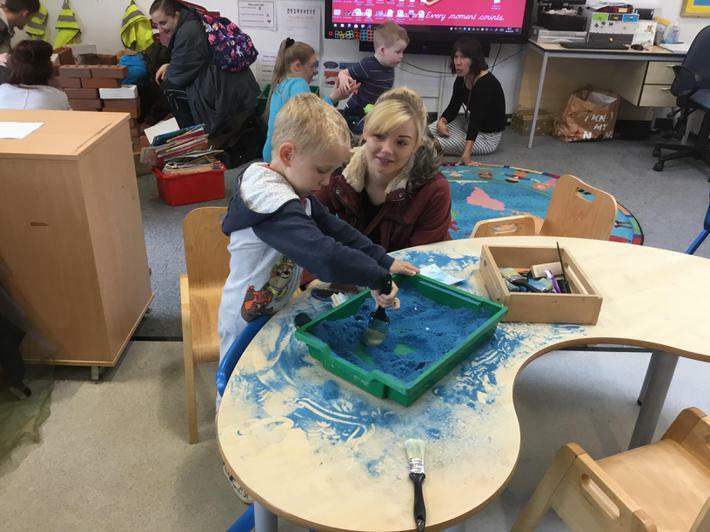 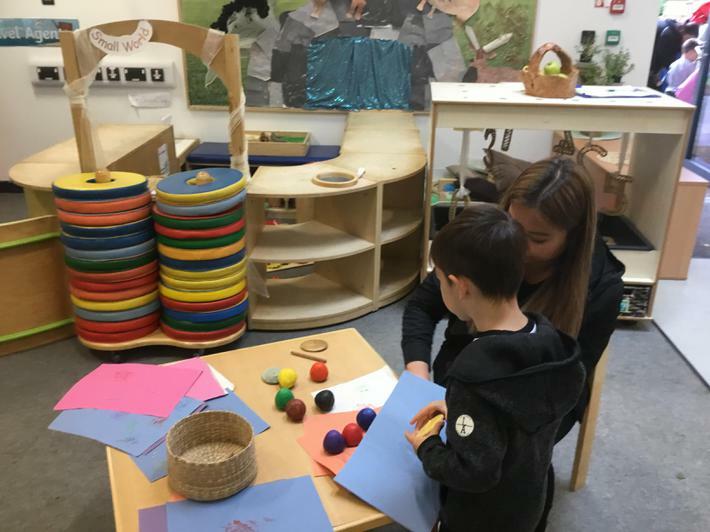 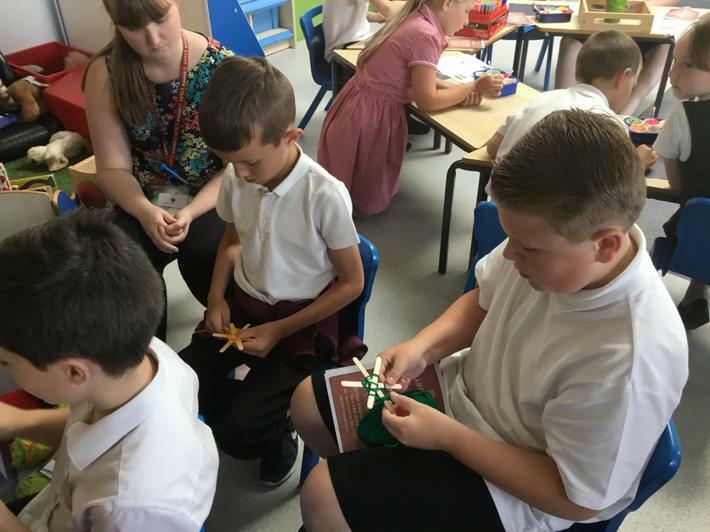 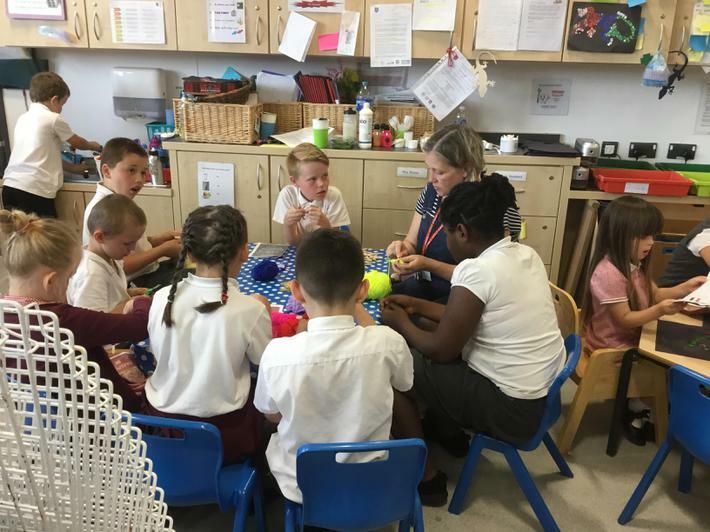 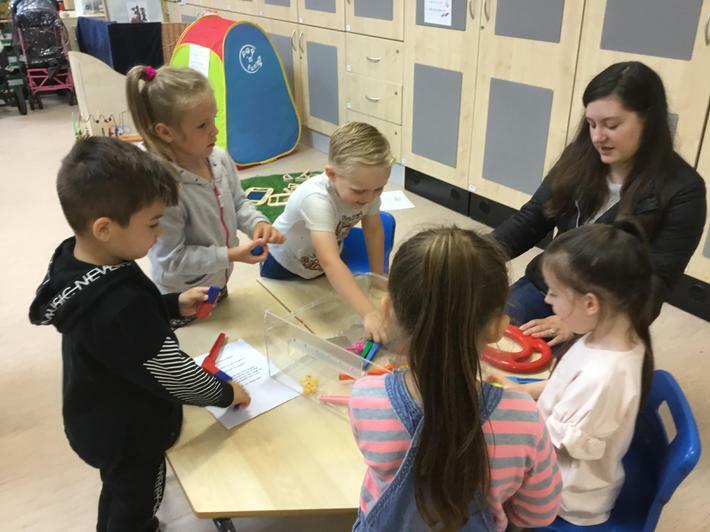 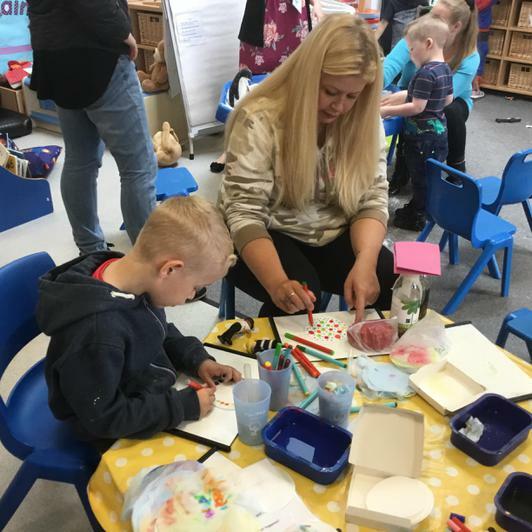 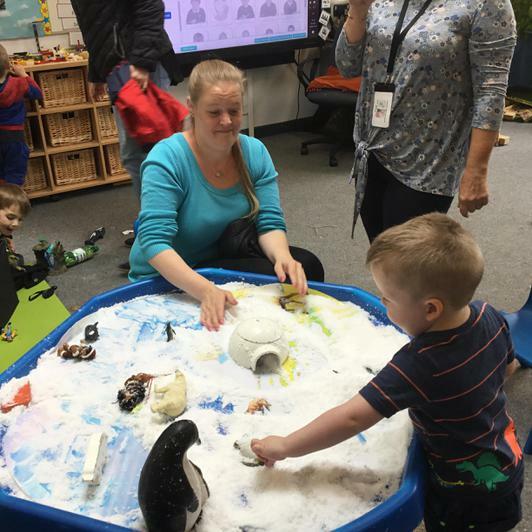 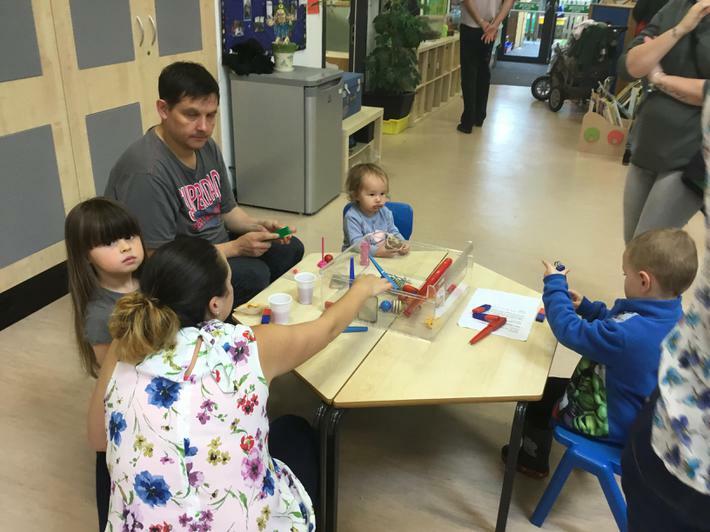 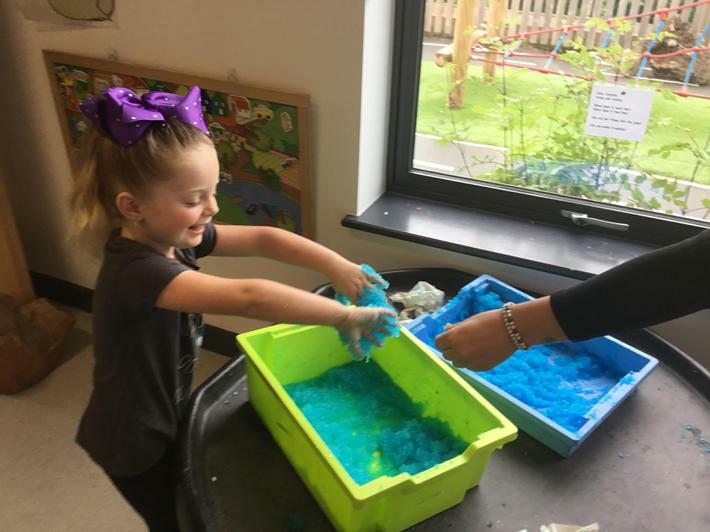 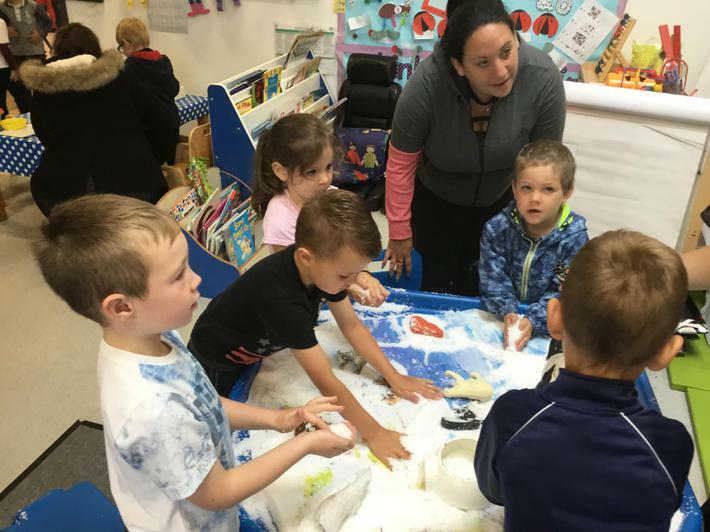 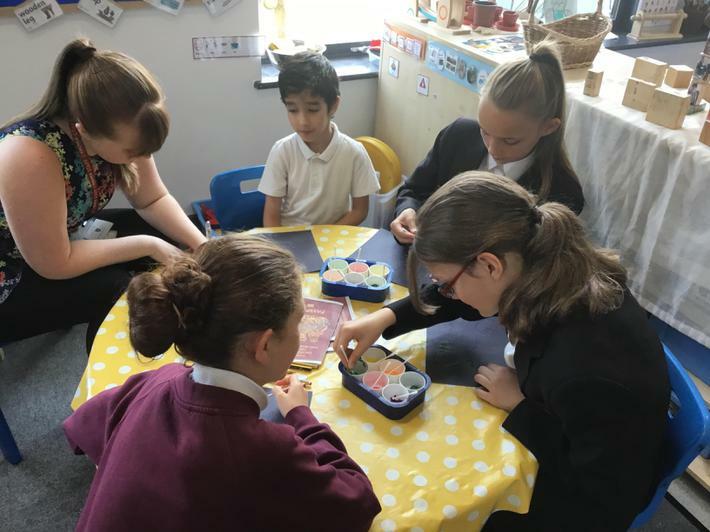 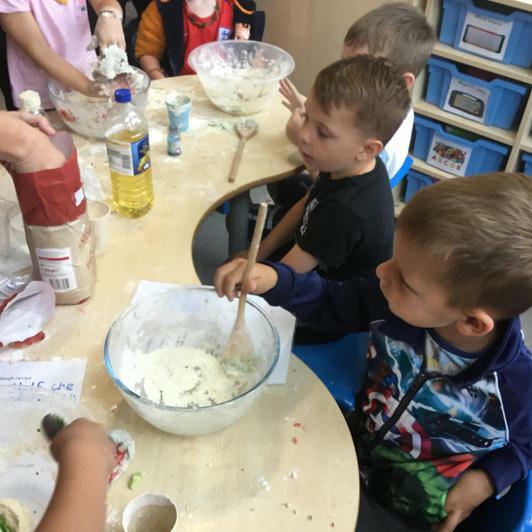 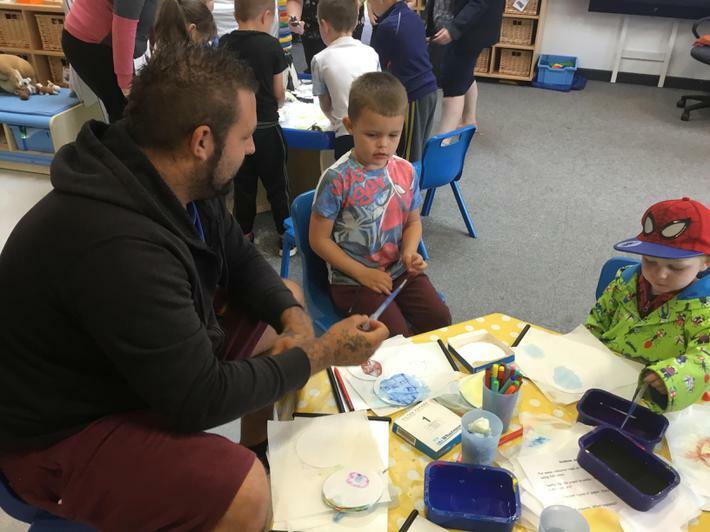 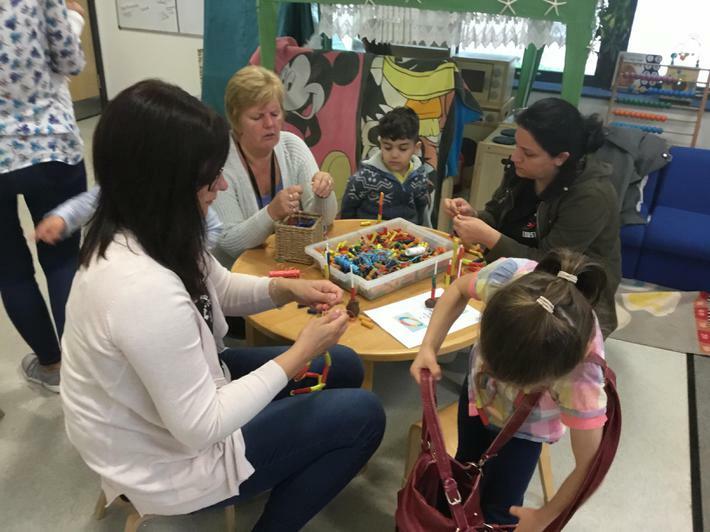 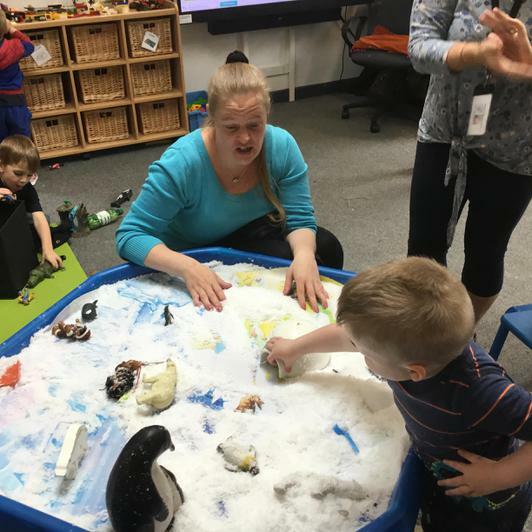 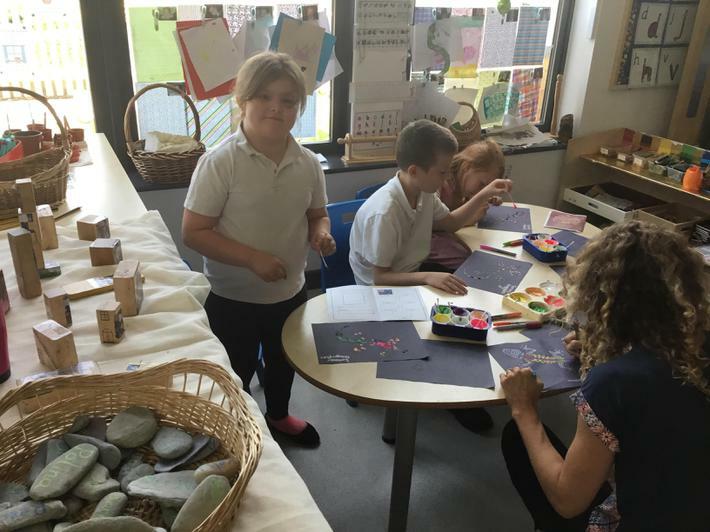 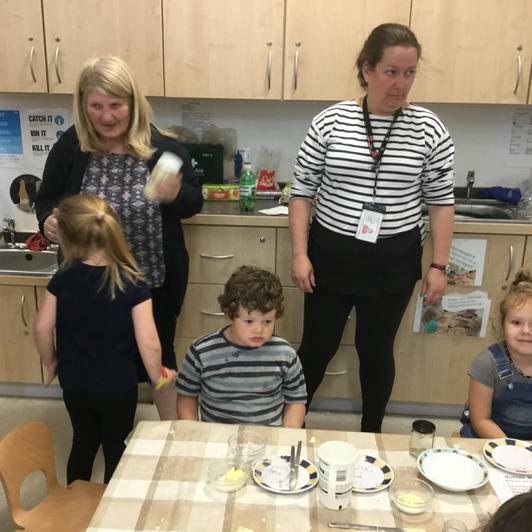 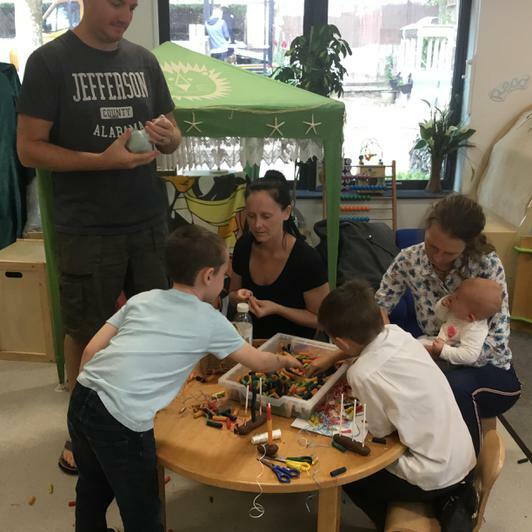 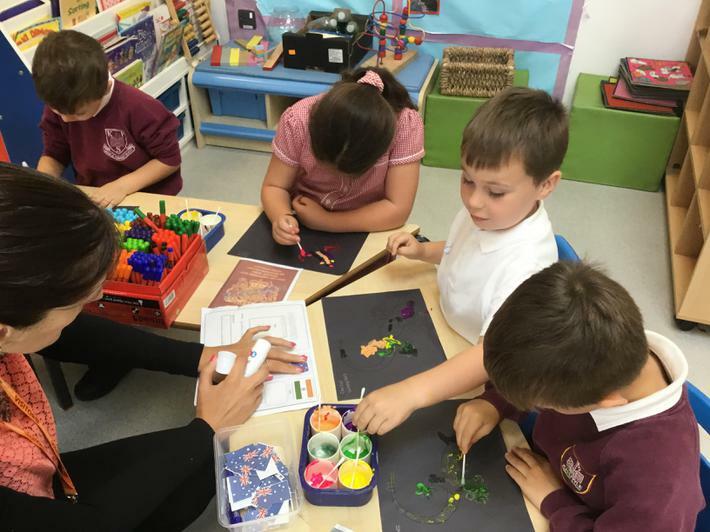 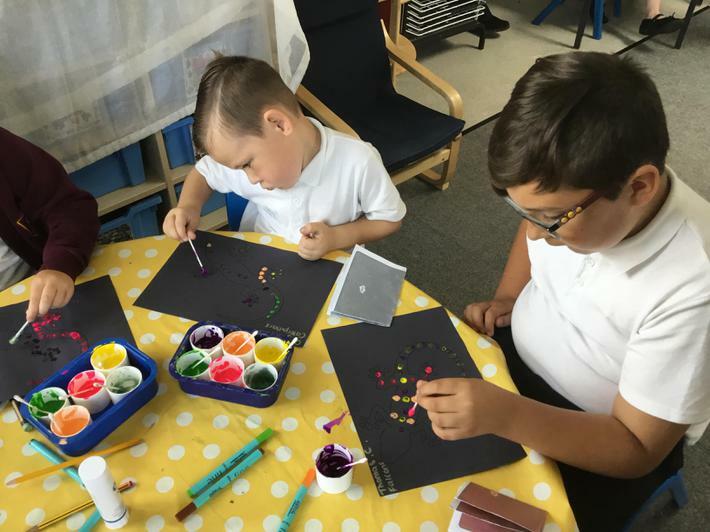 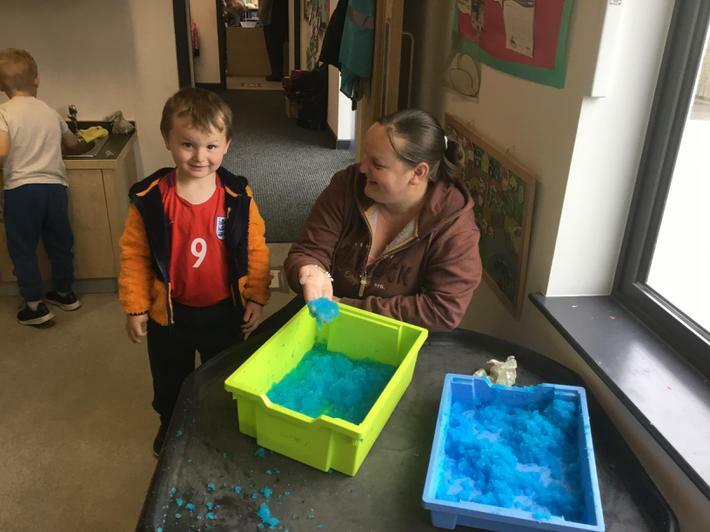 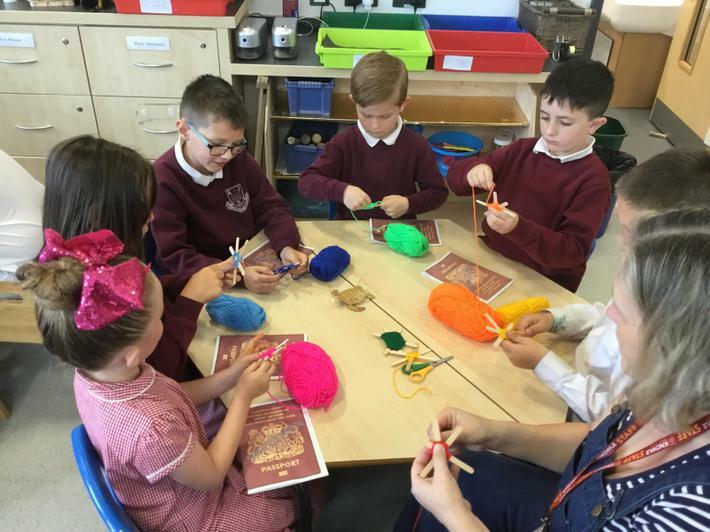 Mrs Leah Burch is the school's Inclusion Coordinator, Leah is an Early Years specialist and she will also be working closely with our Foundation unit. 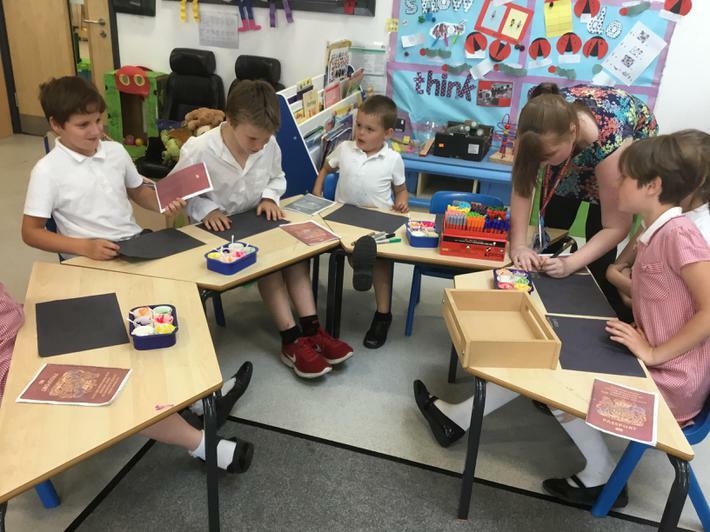 Check out the website below to see how we teach the children in Foundation class Phonics for Reading. 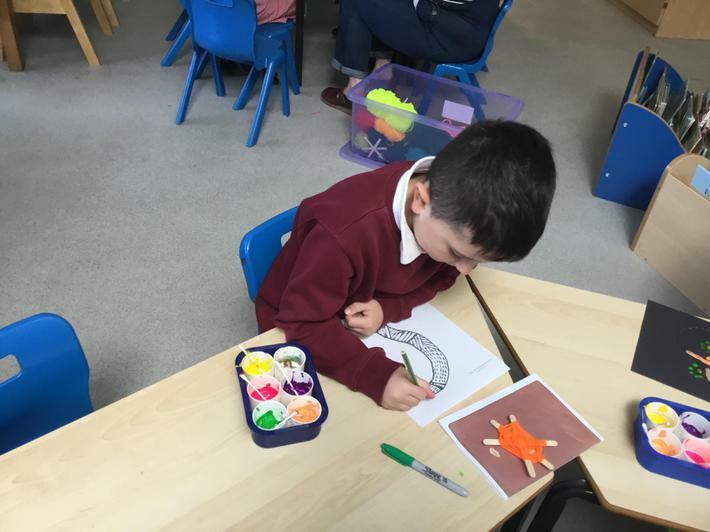 We are learning the story of 'Going on a Bear Hunt' for the first few weeks to familiarise children with sequential language, repetition and rhyme in stories. 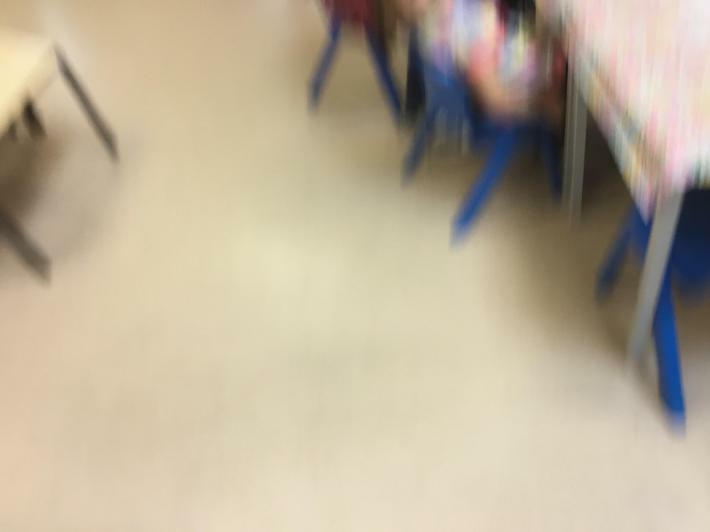 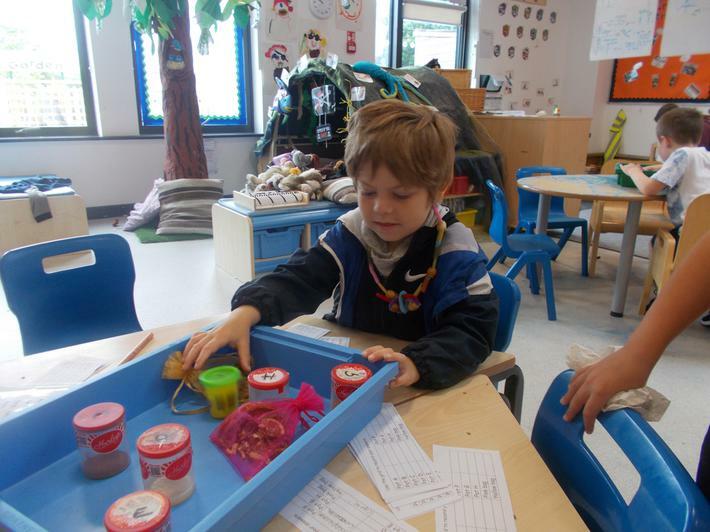 We went on a bear hunt and have been counting how many bears we can find around the classroom. 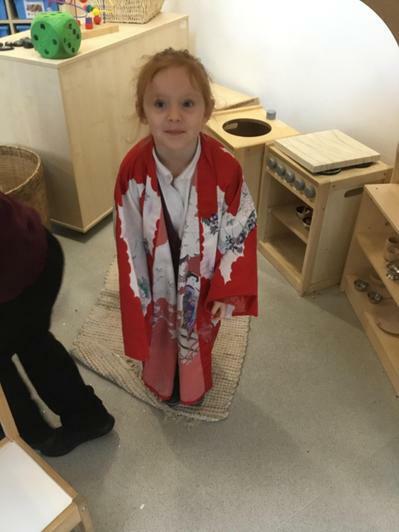 We all had fun during our Multi-cultural days. 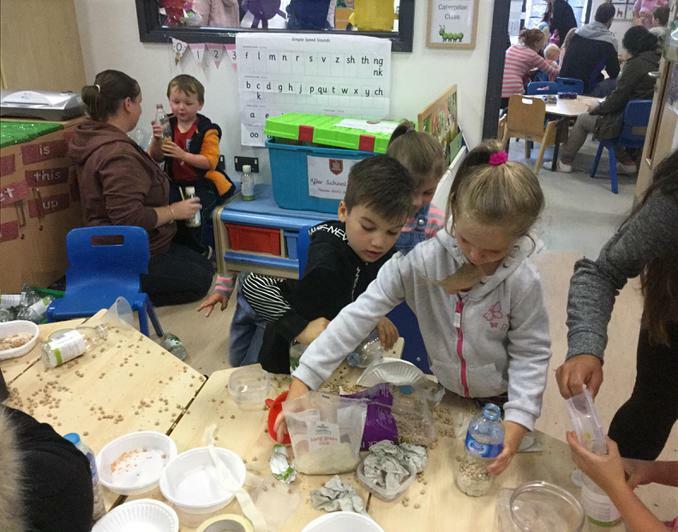 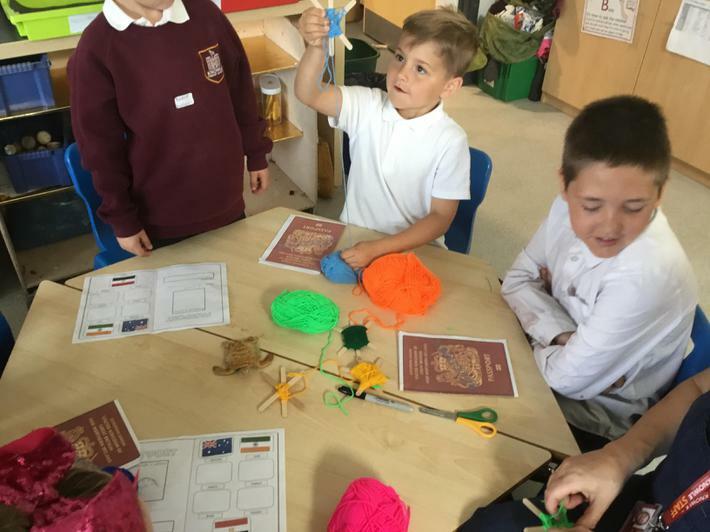 In Foundation we learnt about Australia. 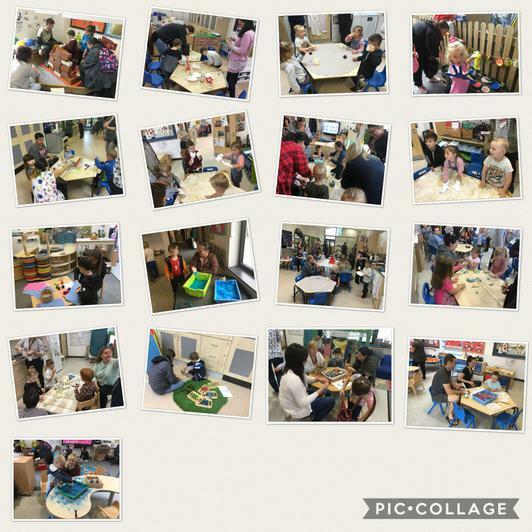 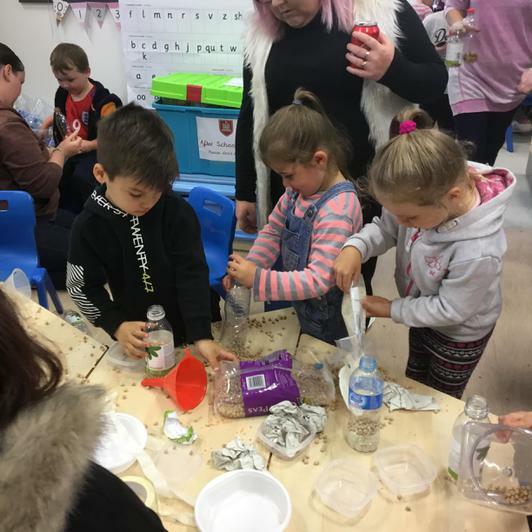 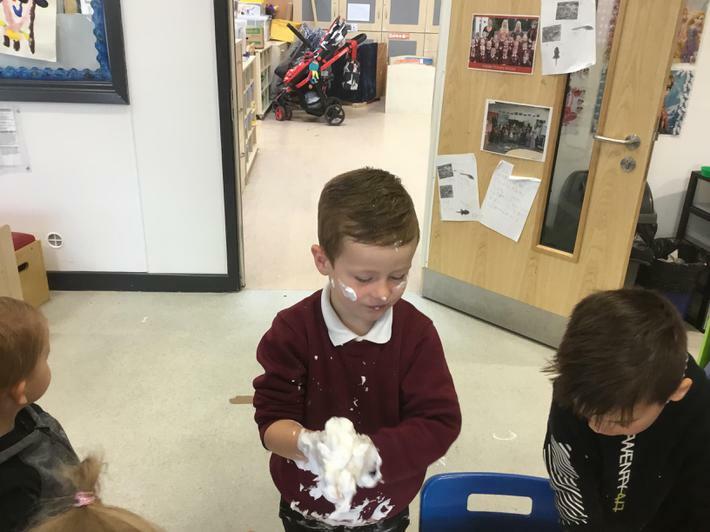 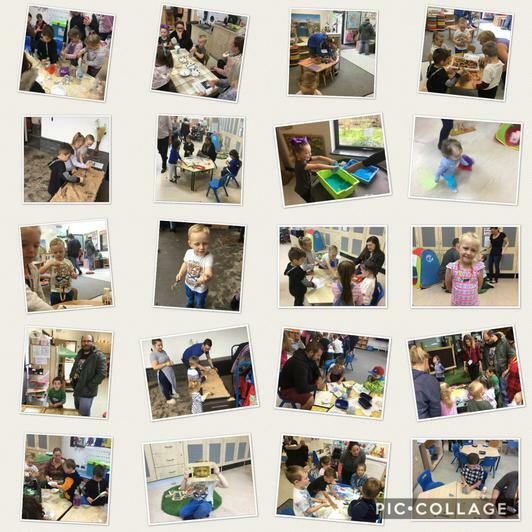 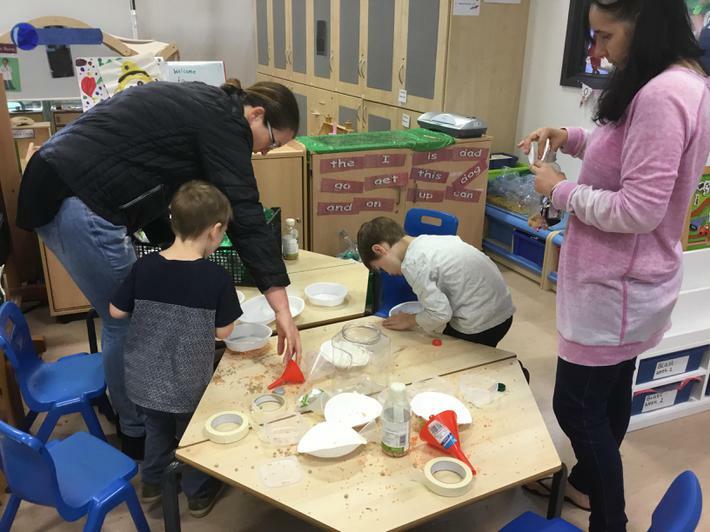 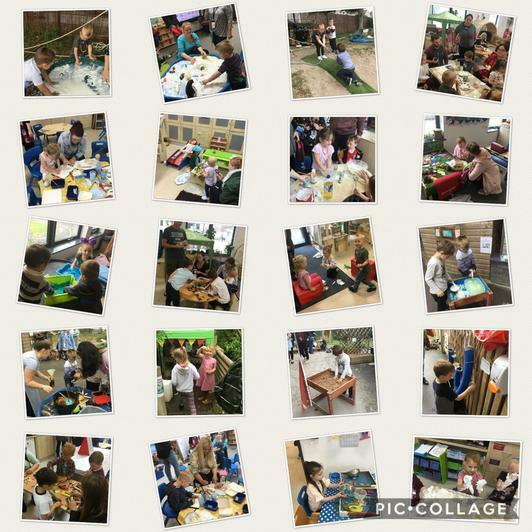 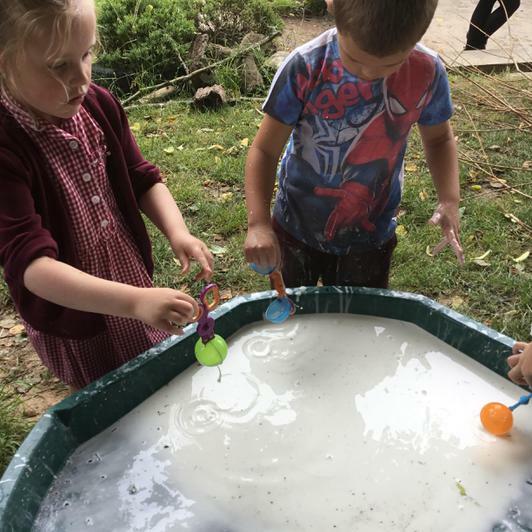 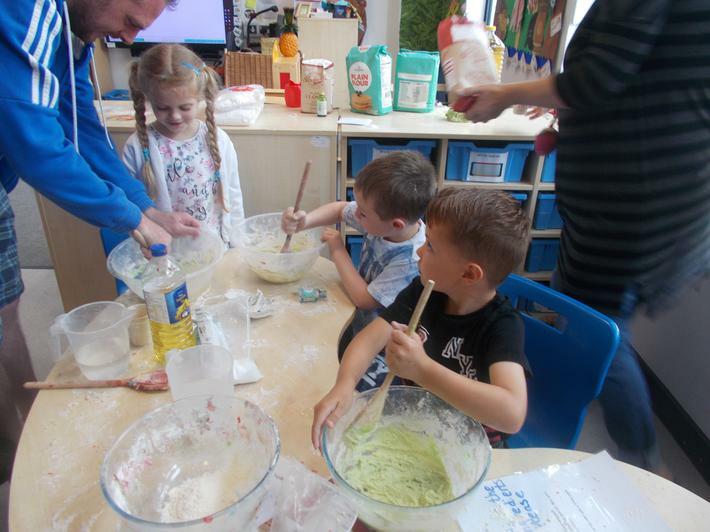 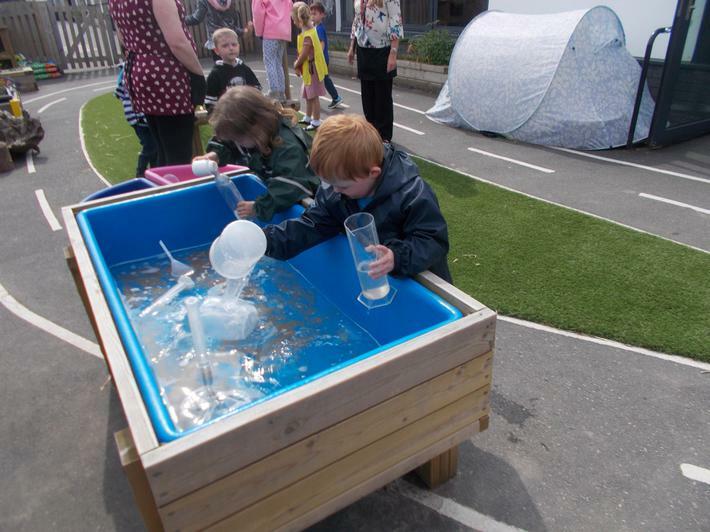 Everyone had a fantastic time at our Science event last term. 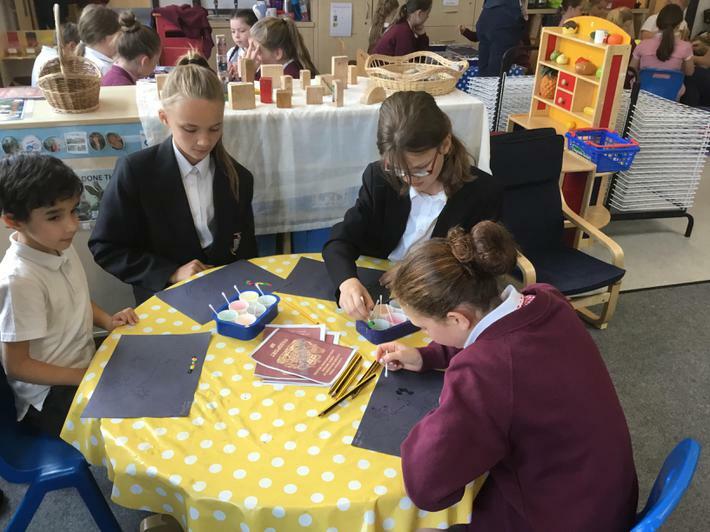 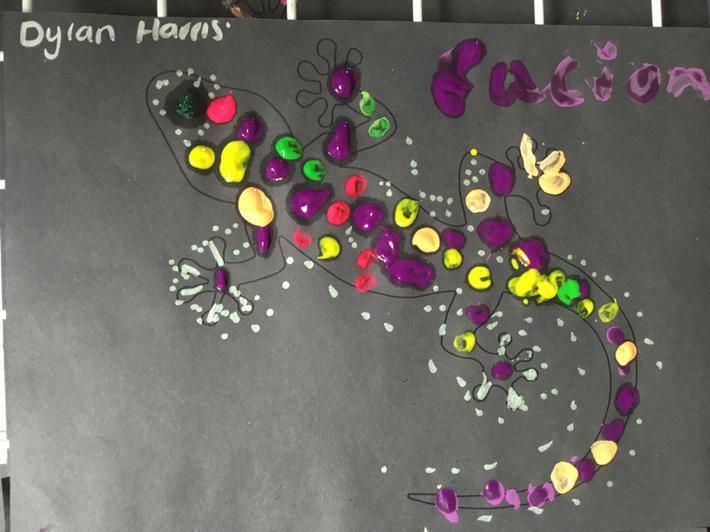 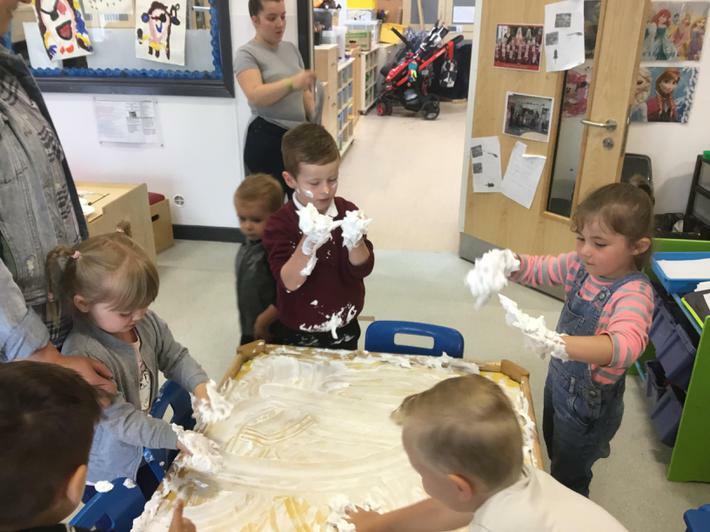 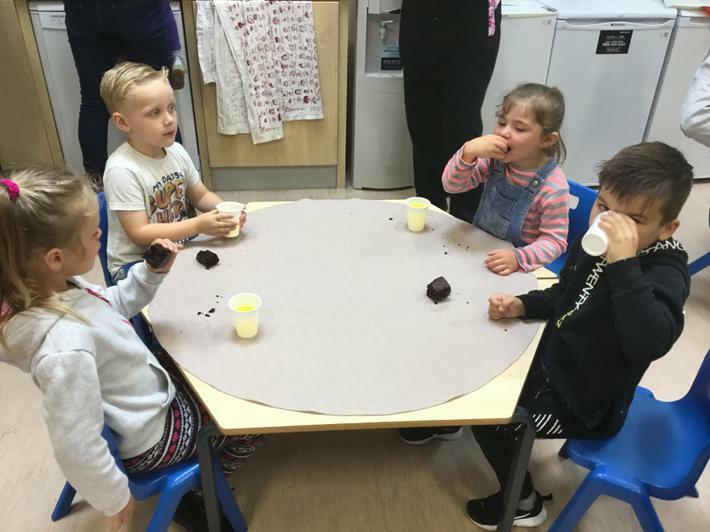 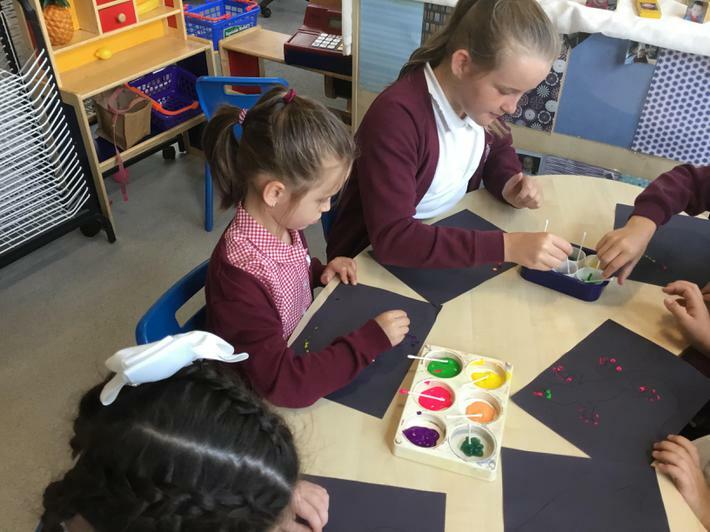 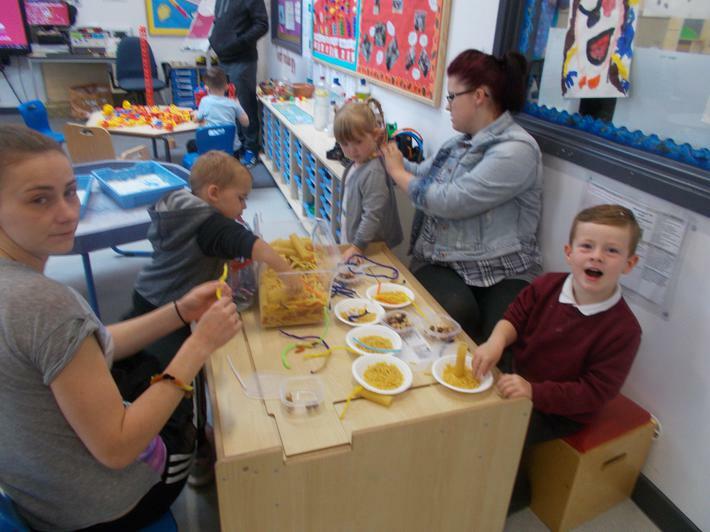 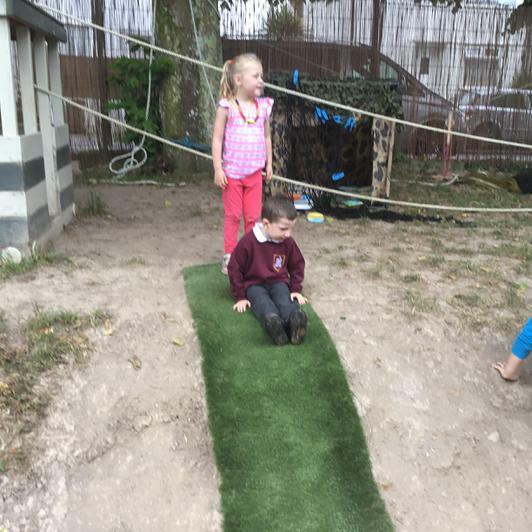 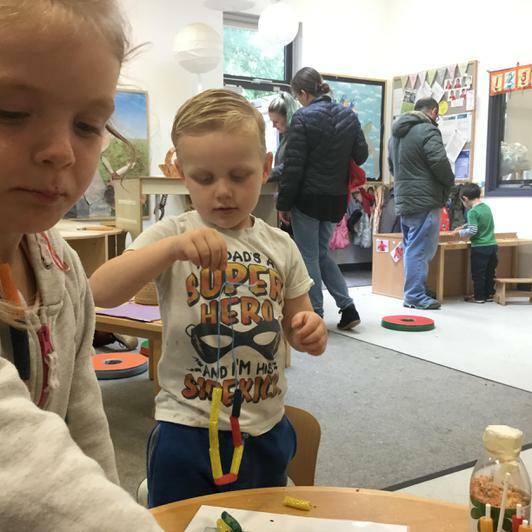 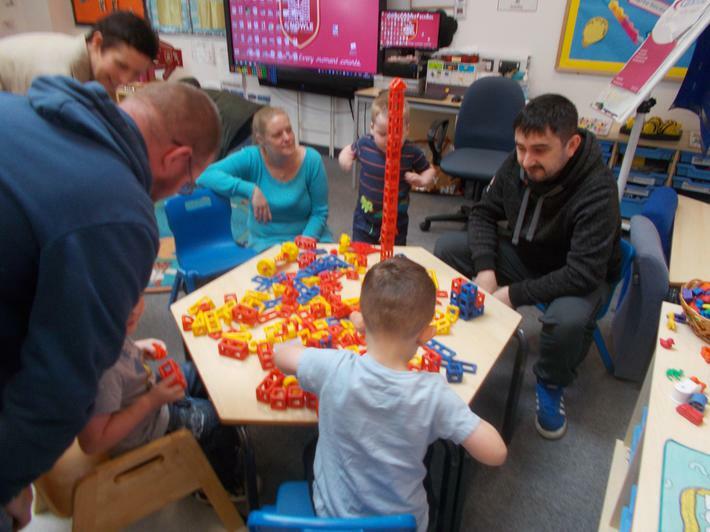 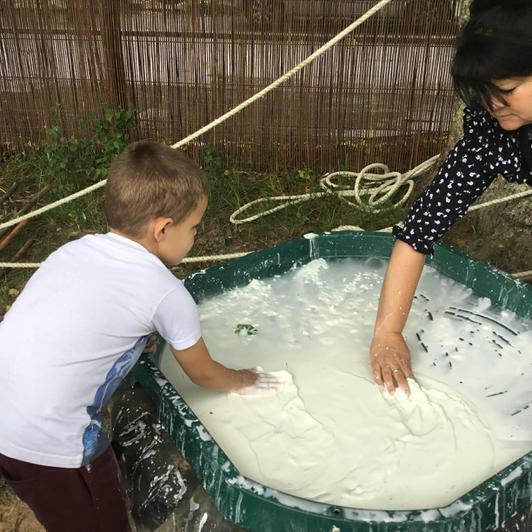 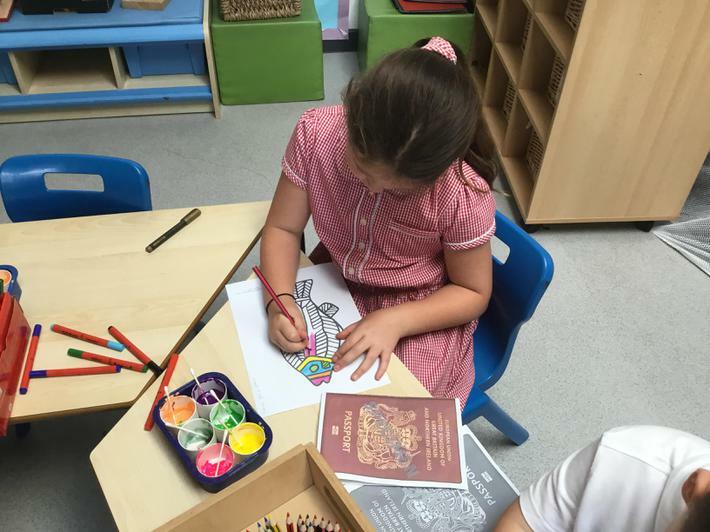 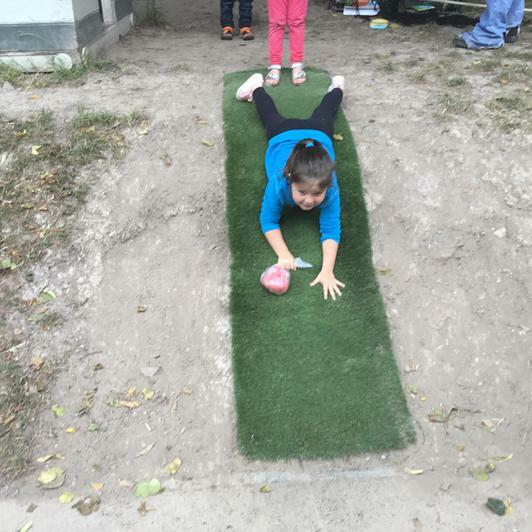 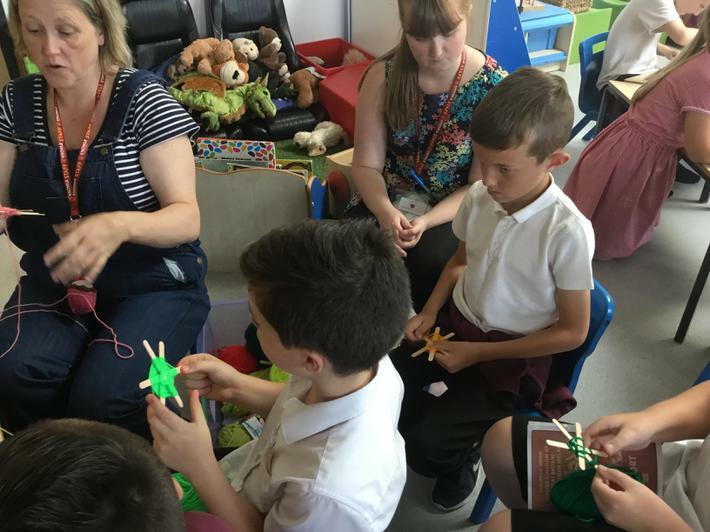 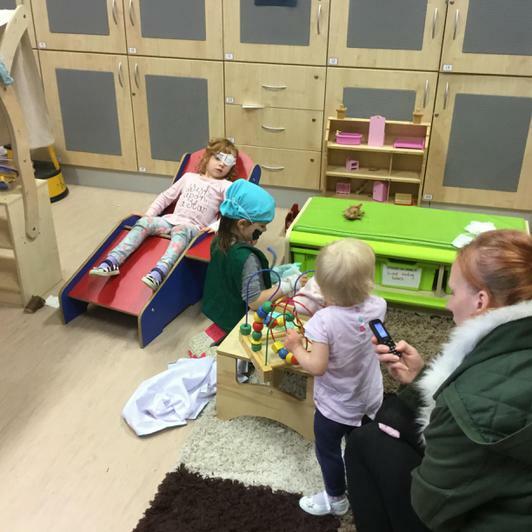 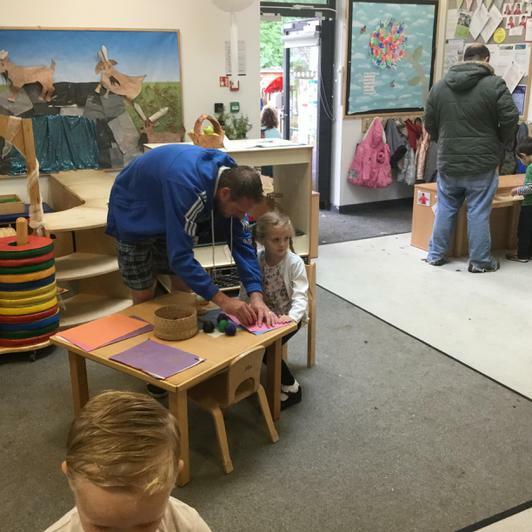 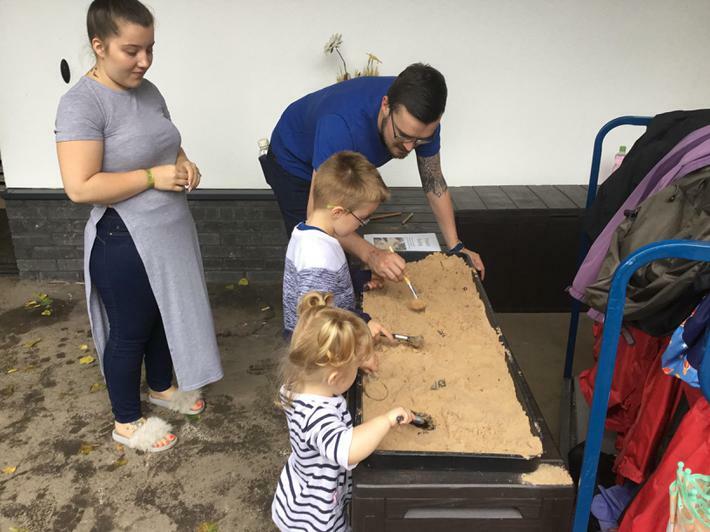 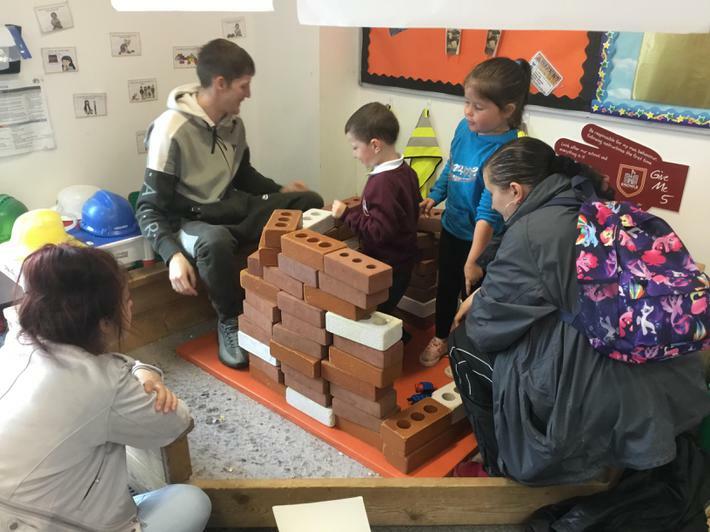 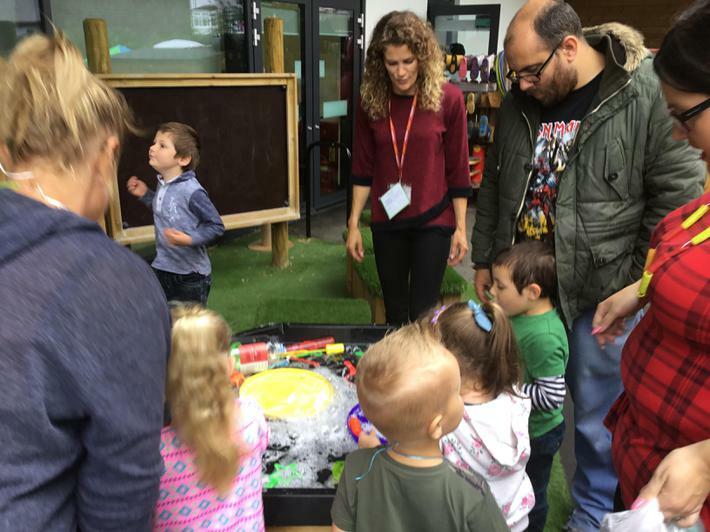 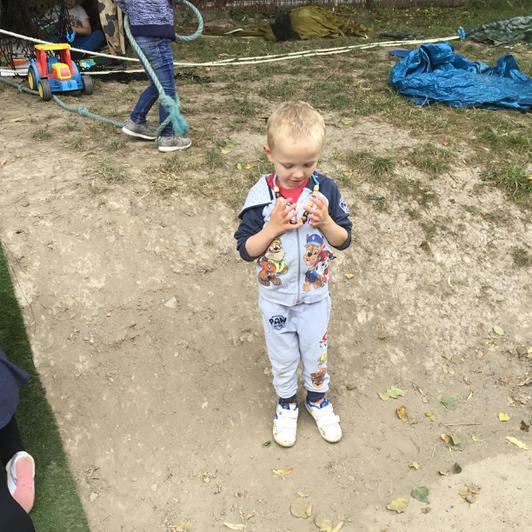 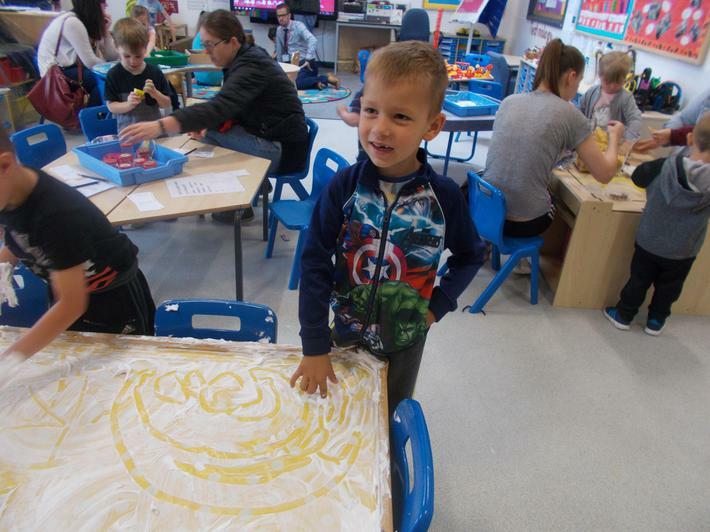 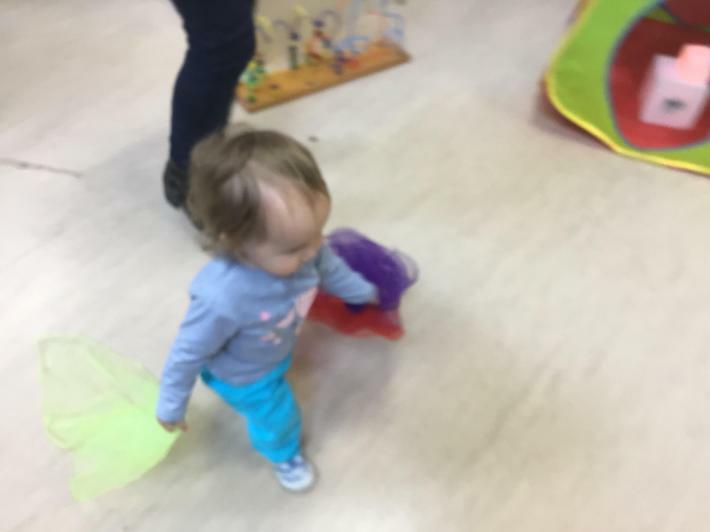 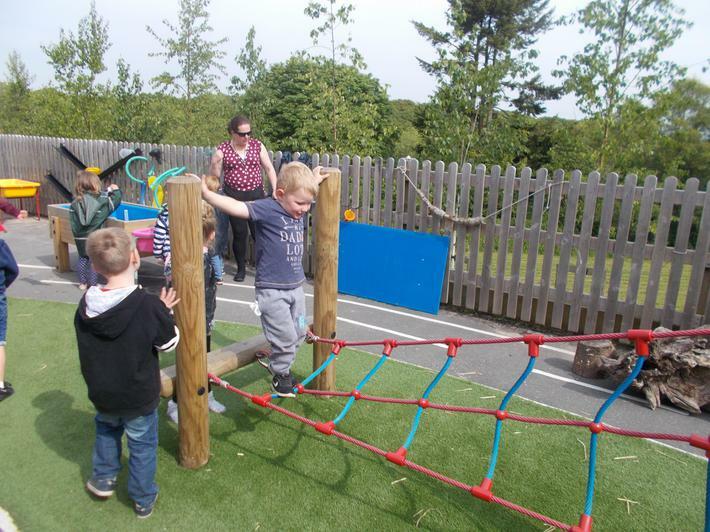 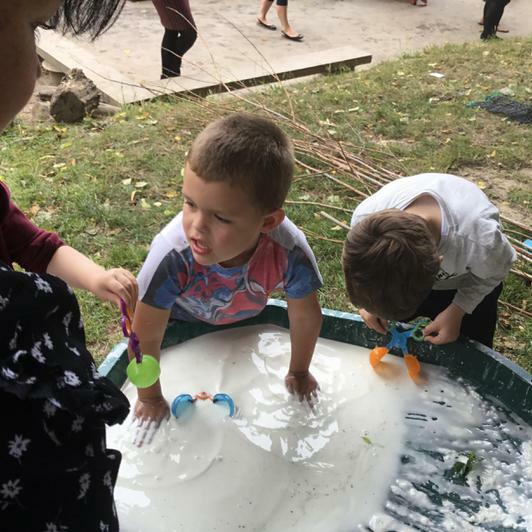 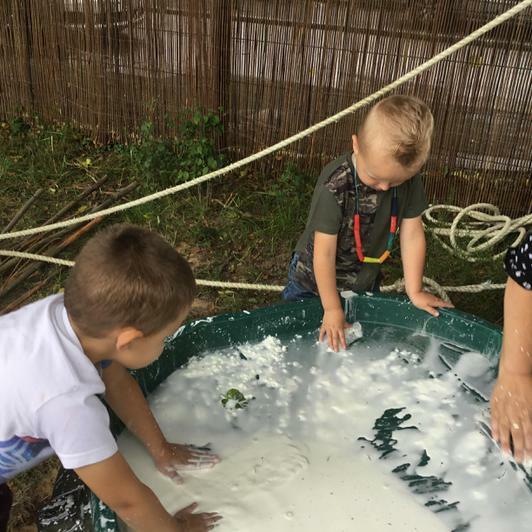 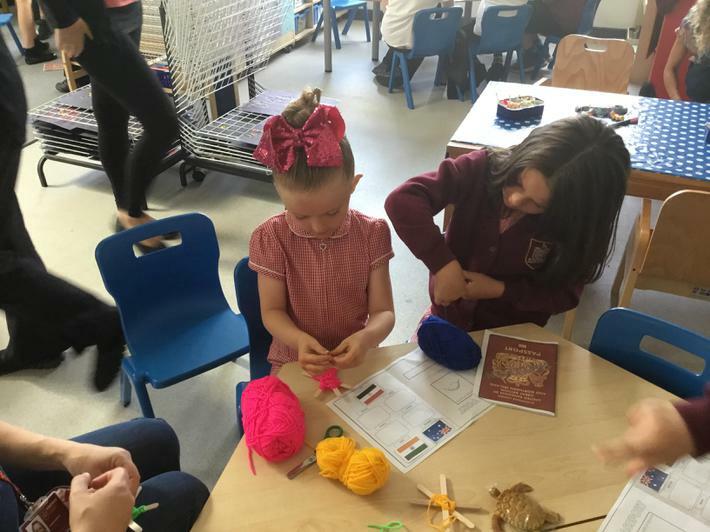 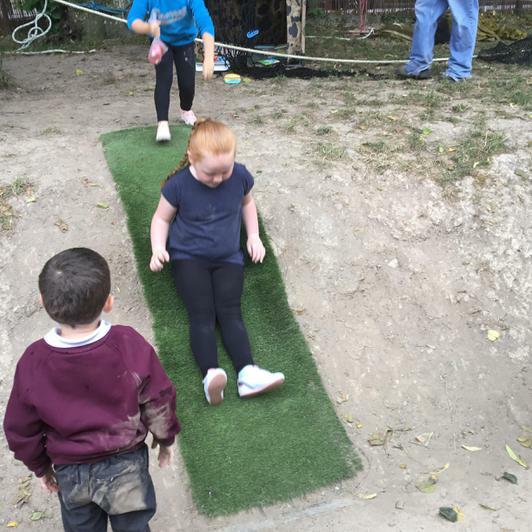 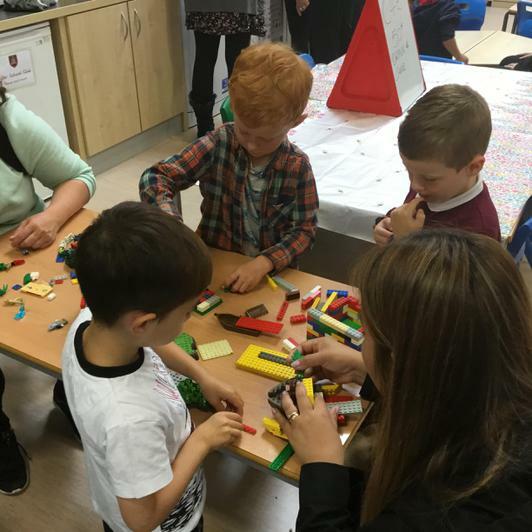 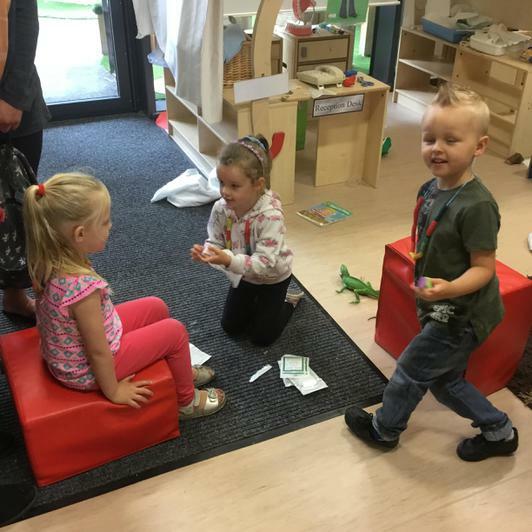 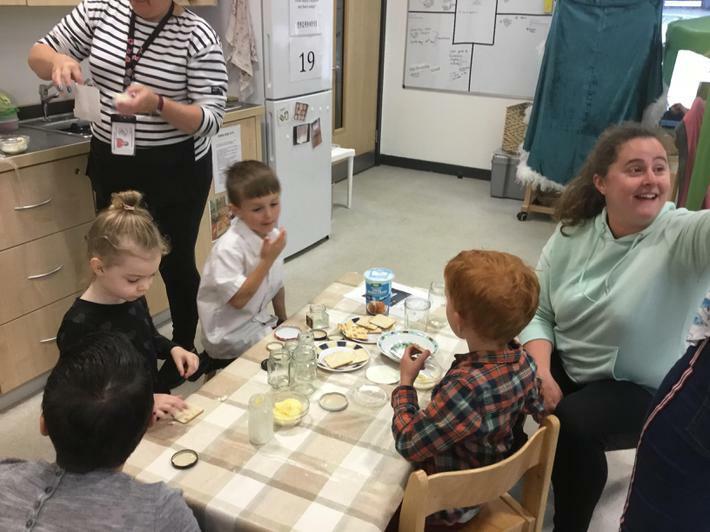 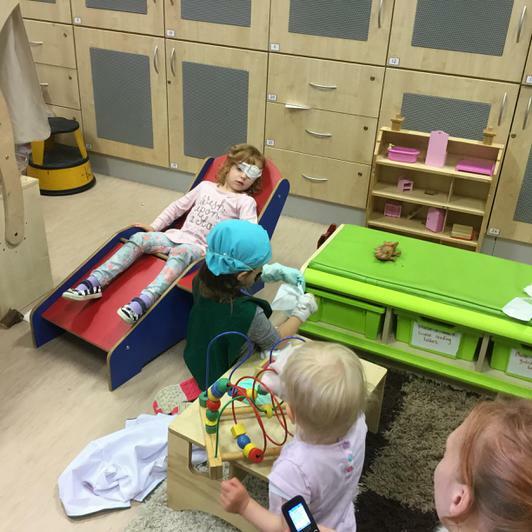 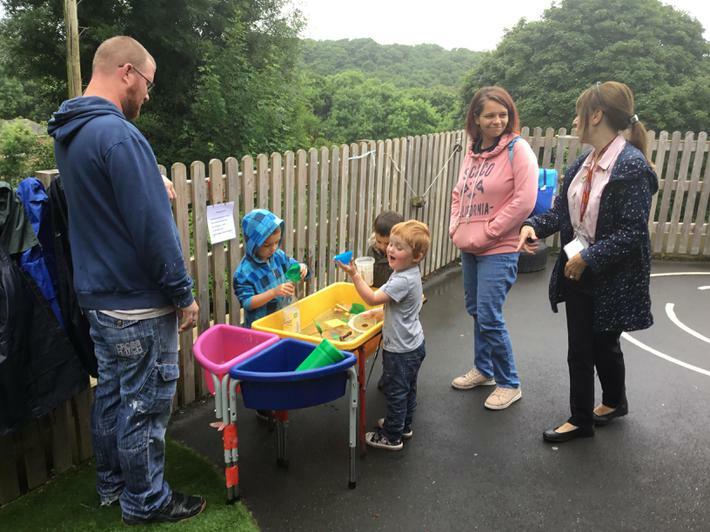 It was lovely to see the new children and our foundation children exploring all of the activities. 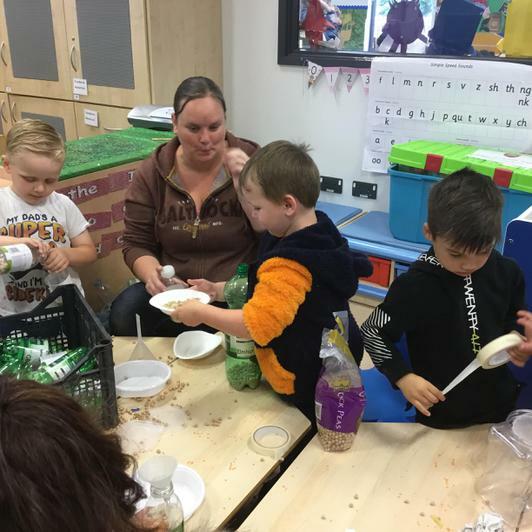 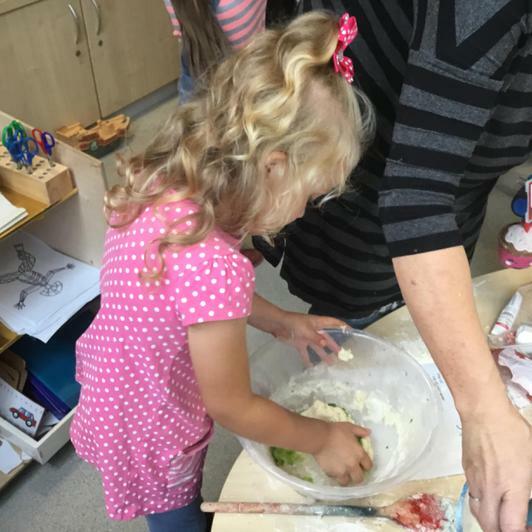 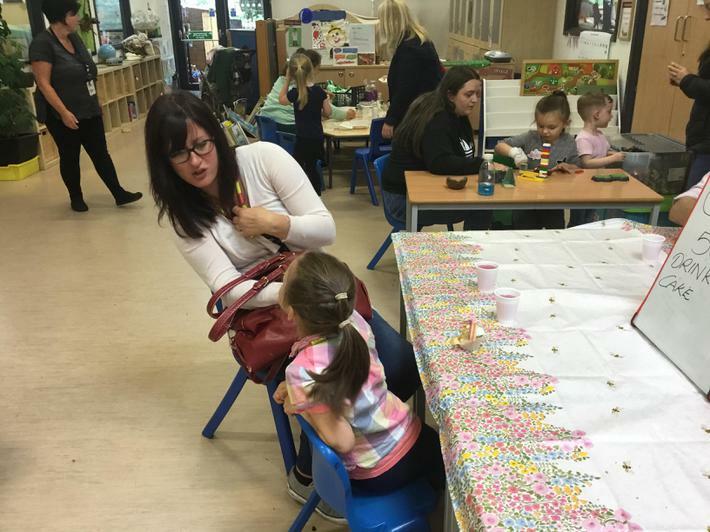 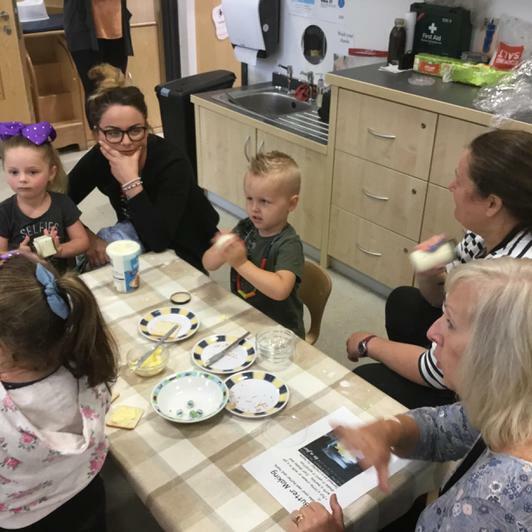 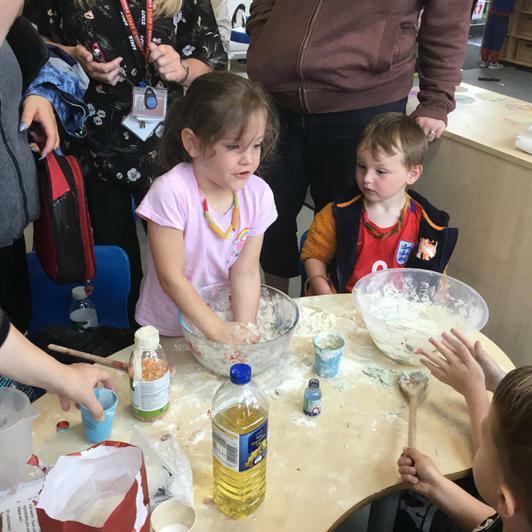 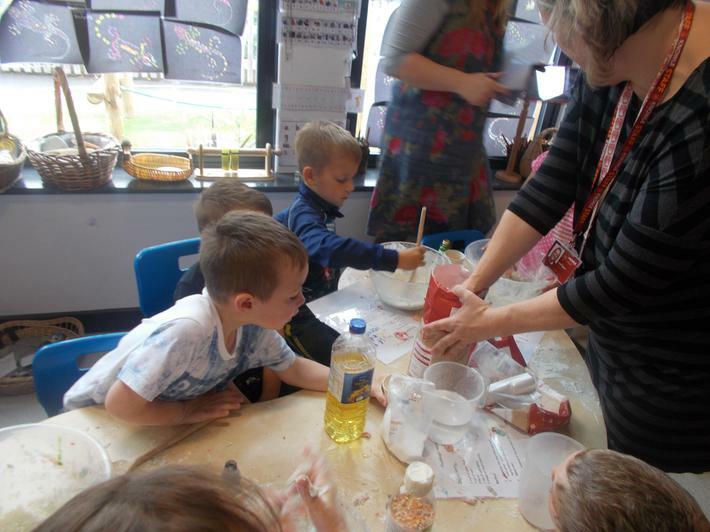 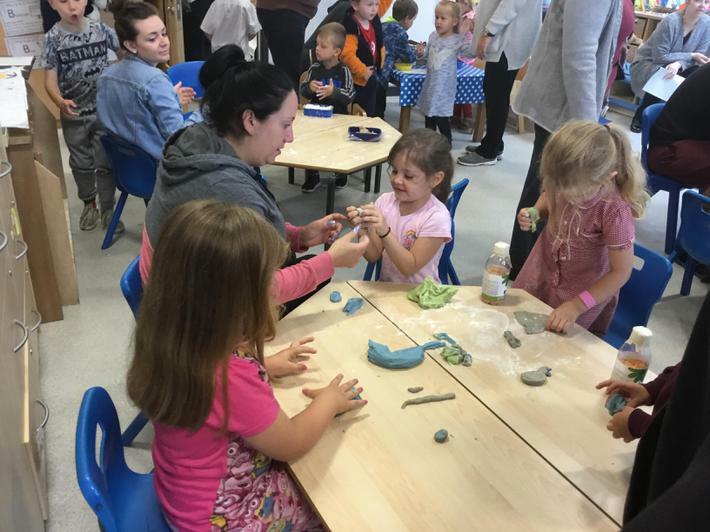 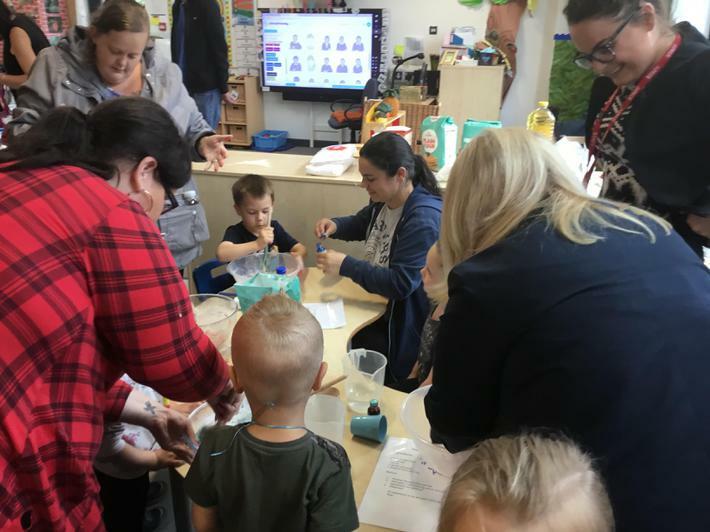 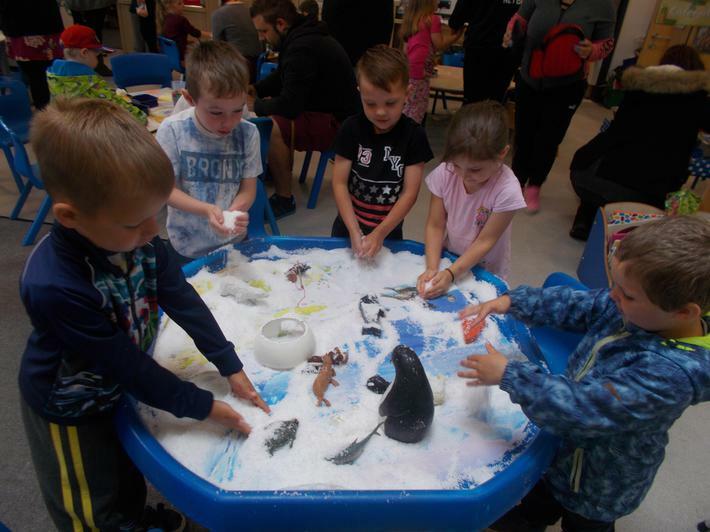 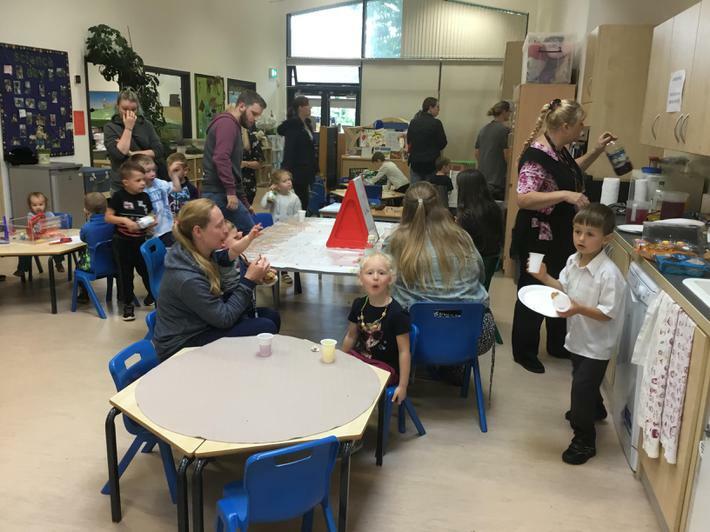 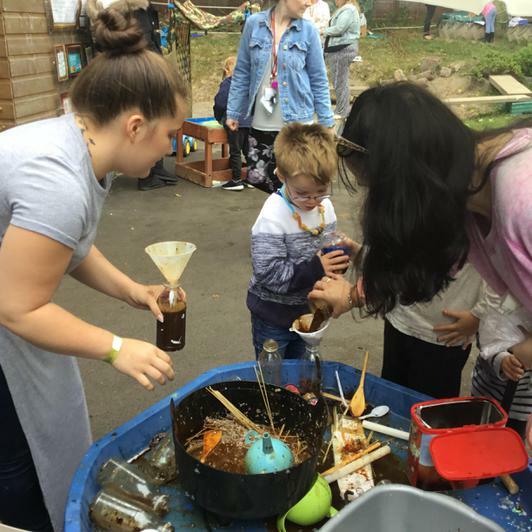 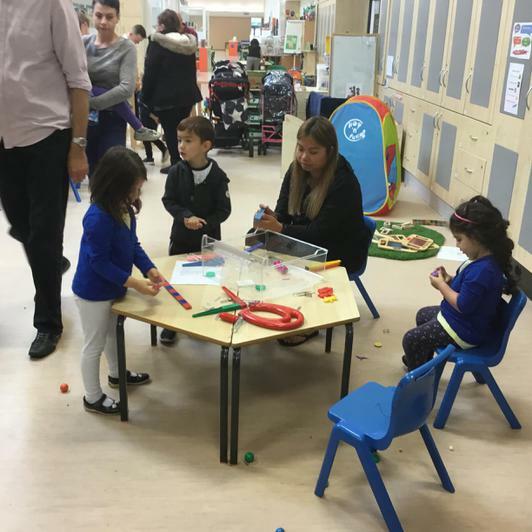 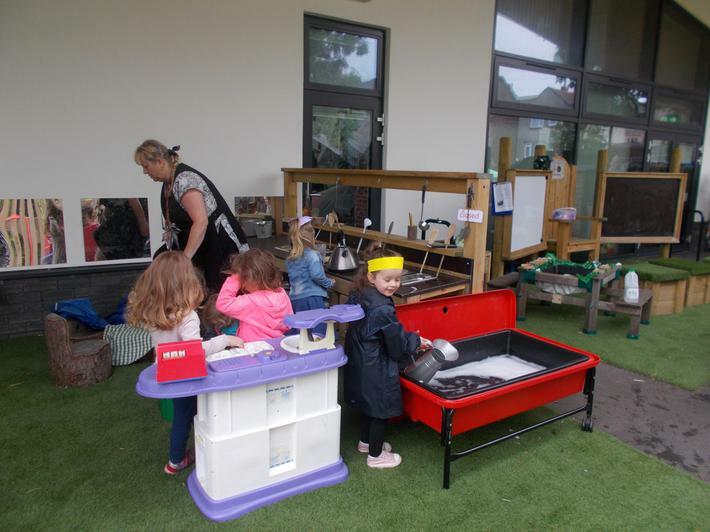 A massive thank-you to the EYFS team and Stepping Stones Pre-School for organising it. 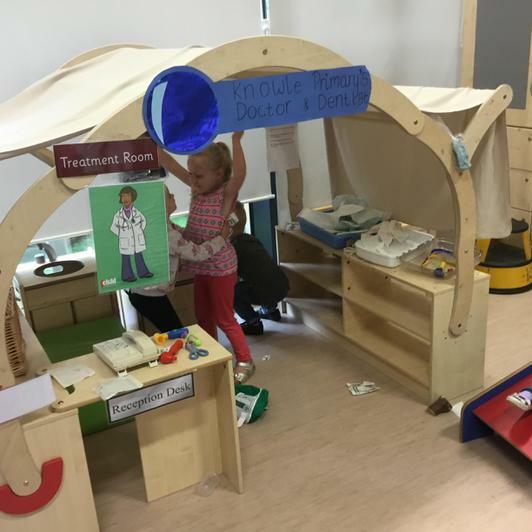 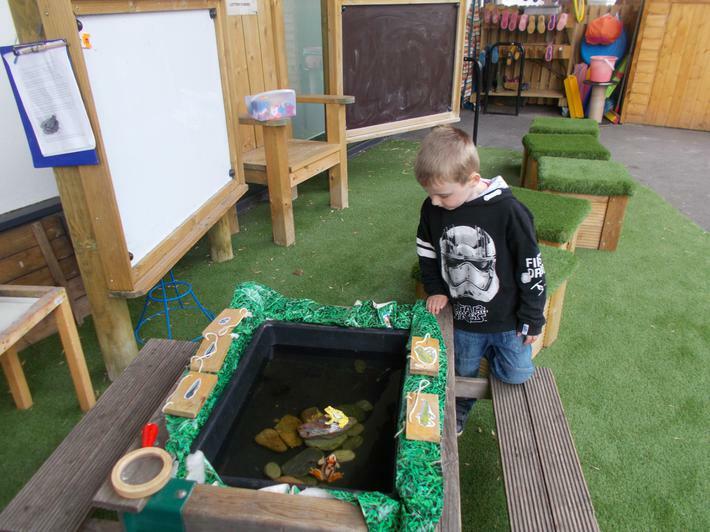 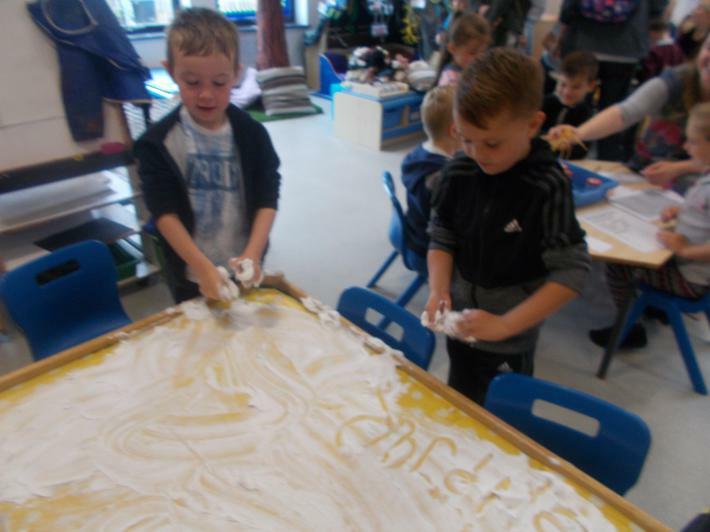 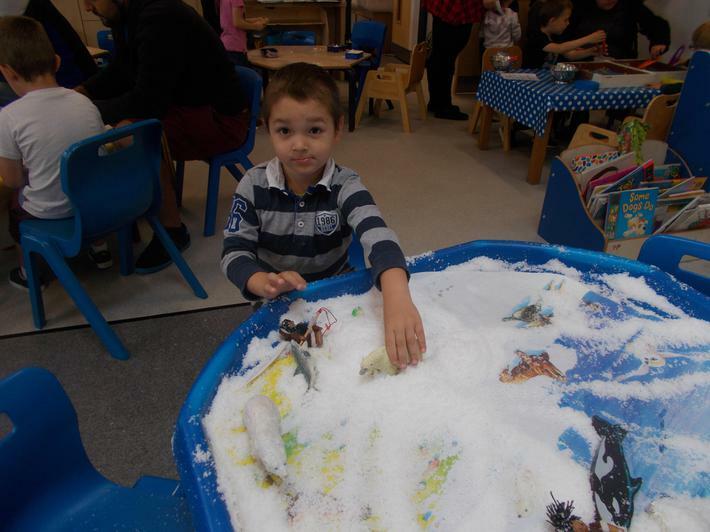 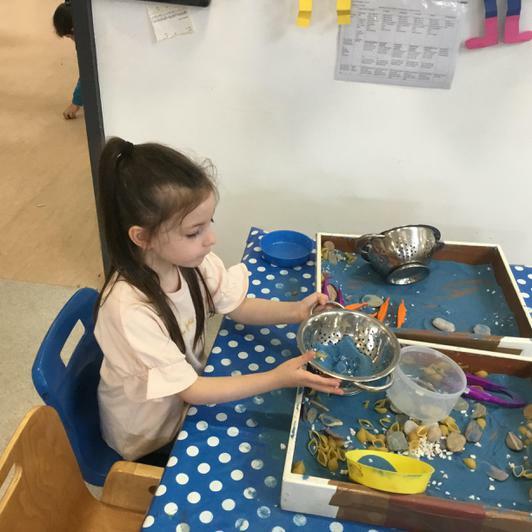 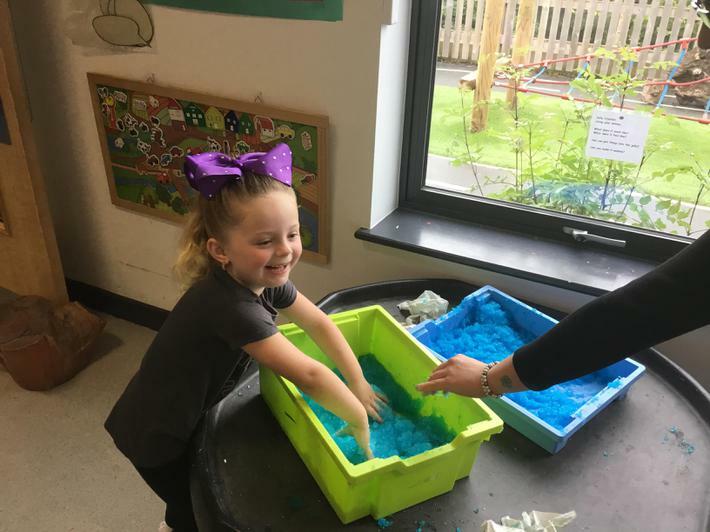 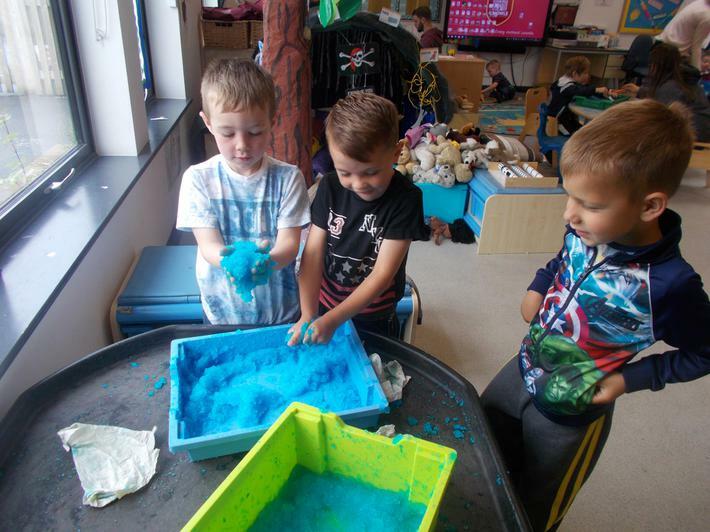 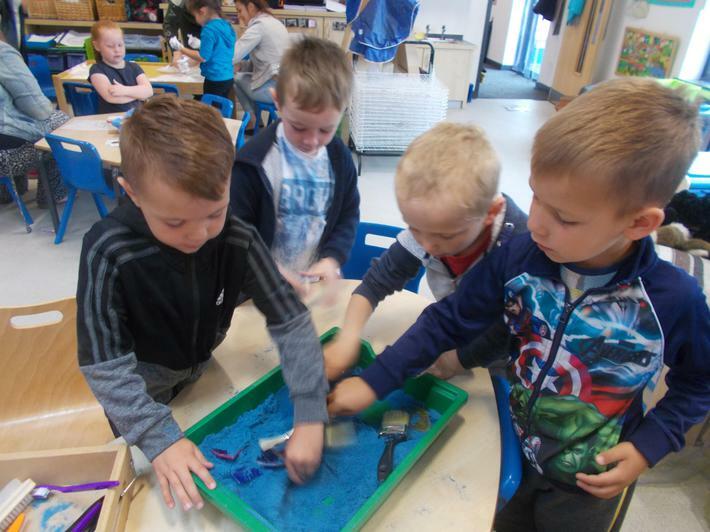 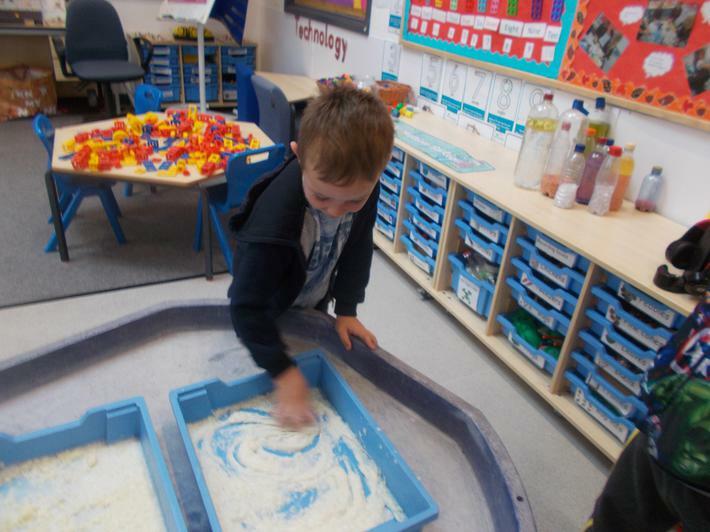 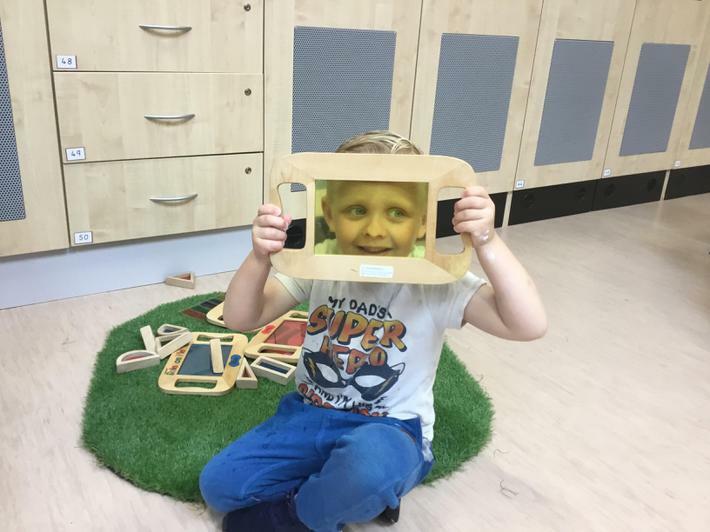 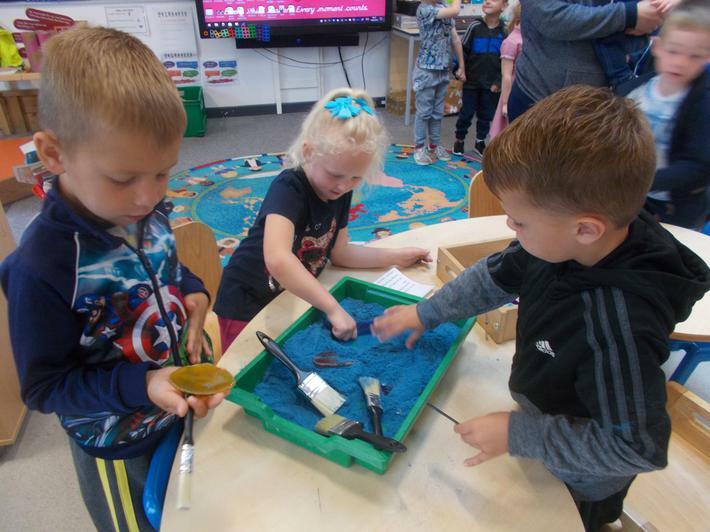 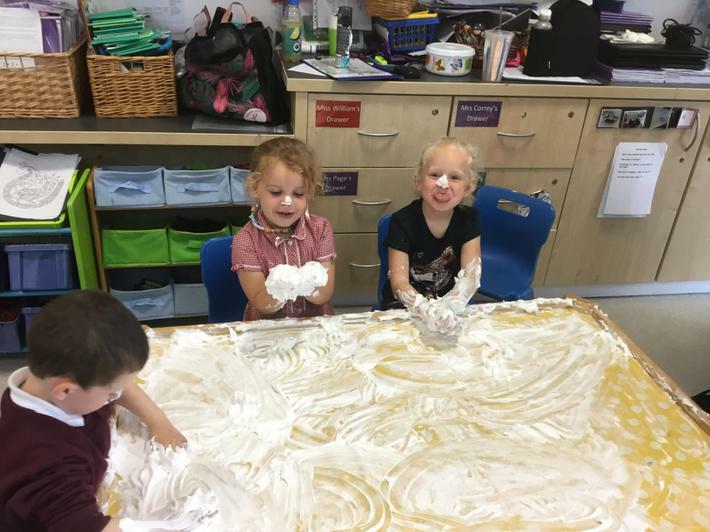 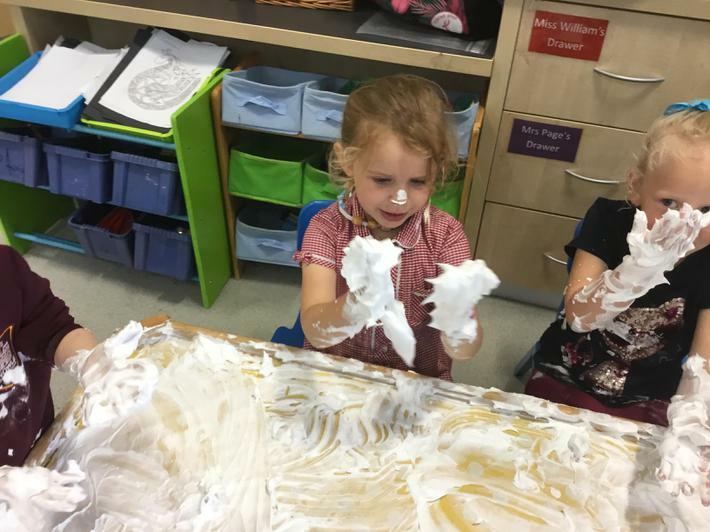 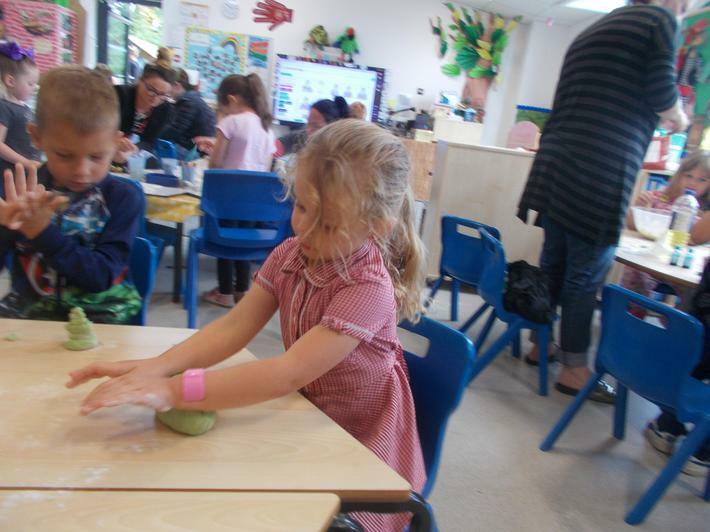 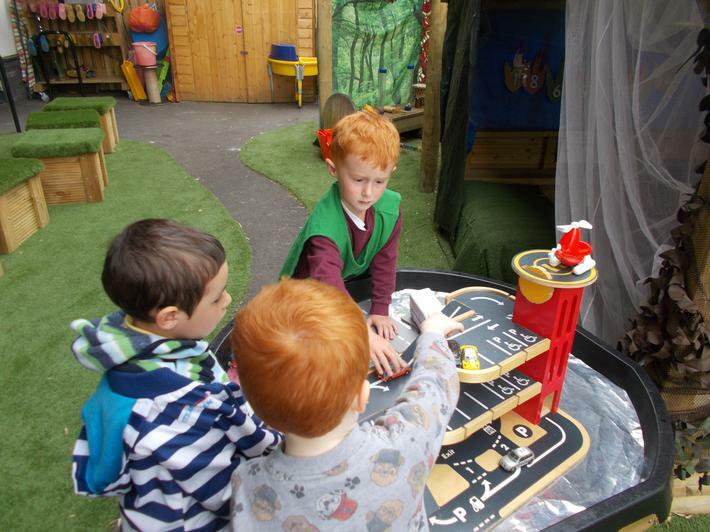 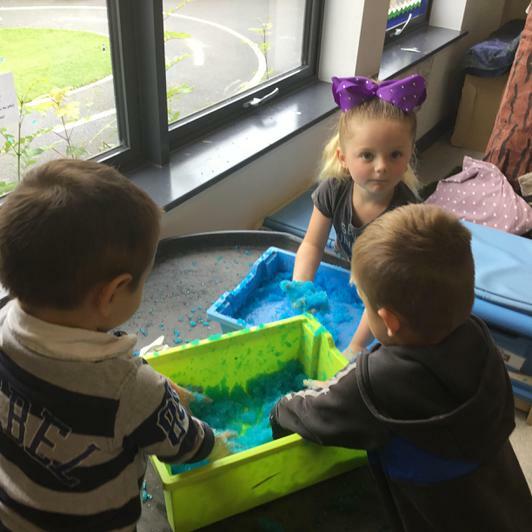 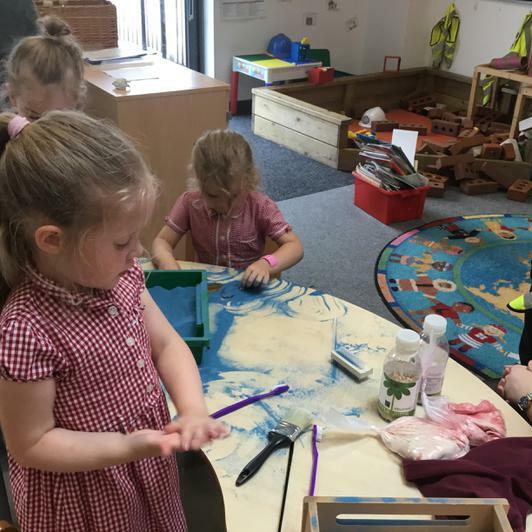 Stepping Stones Nursery children have enjoyed the chance to become familiar with our EYFS setting. 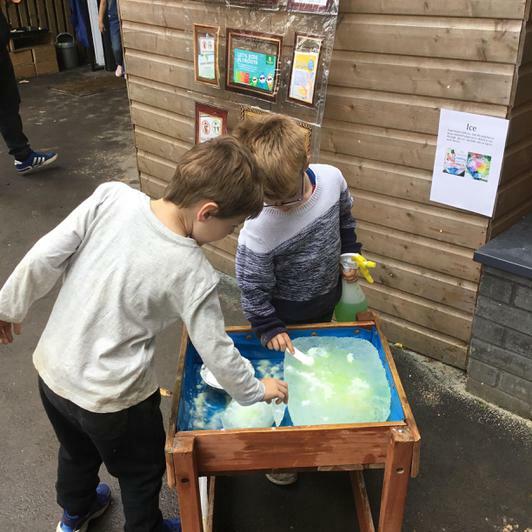 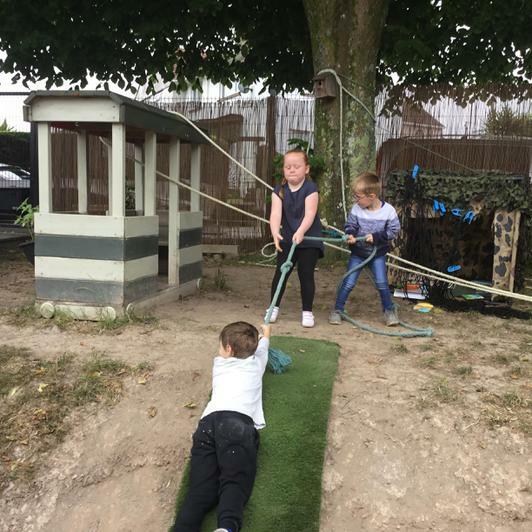 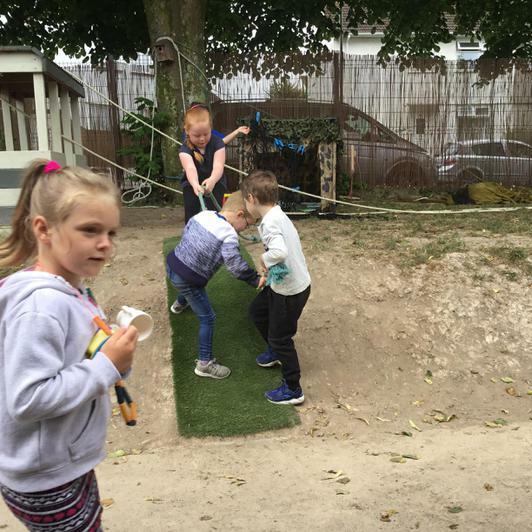 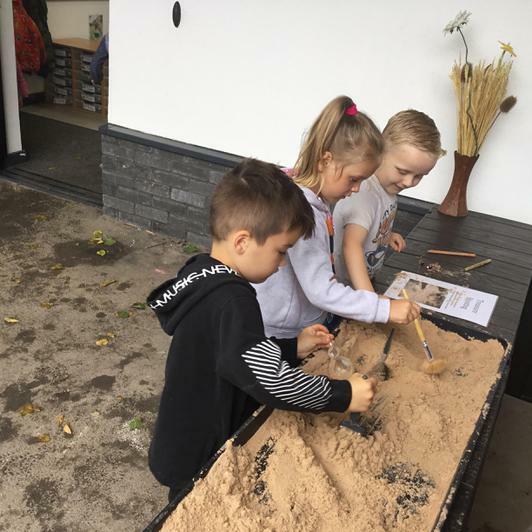 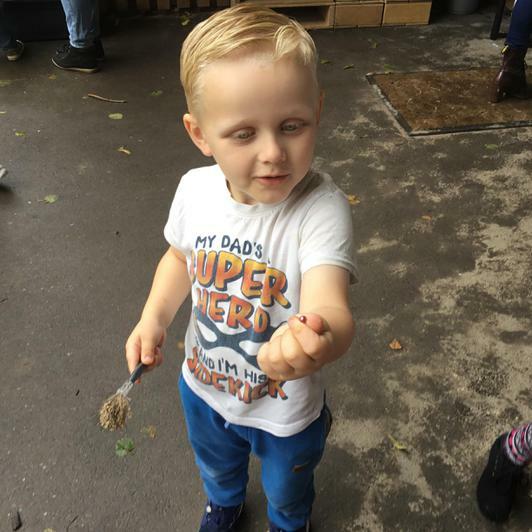 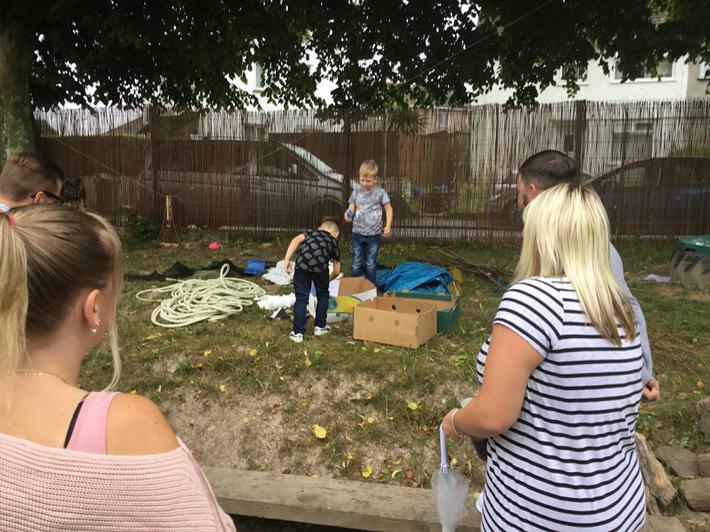 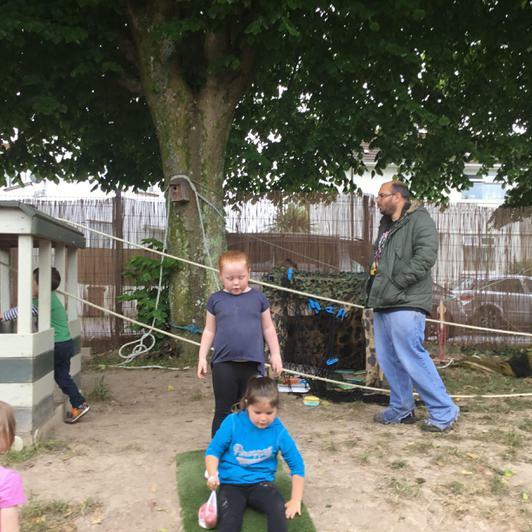 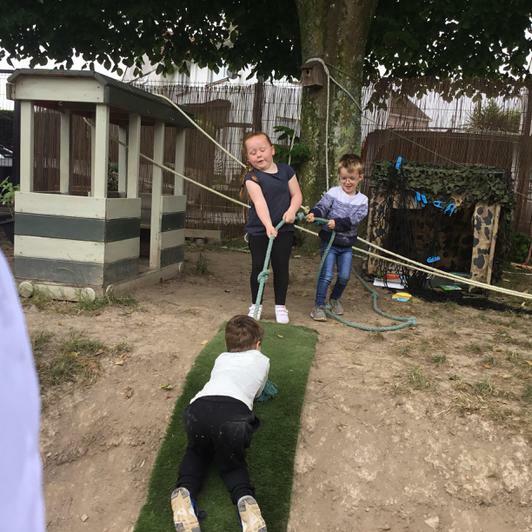 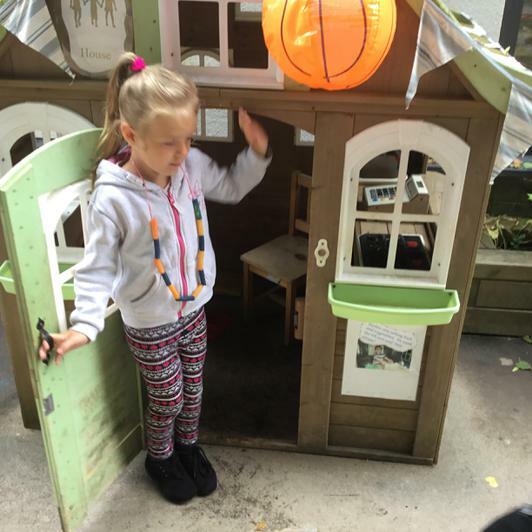 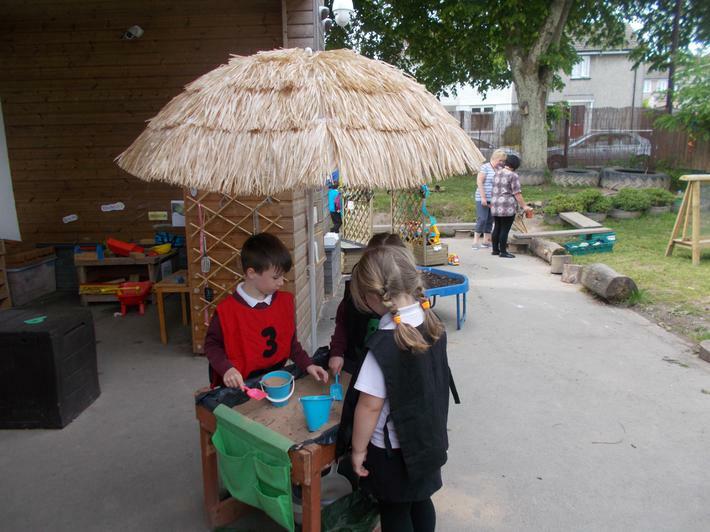 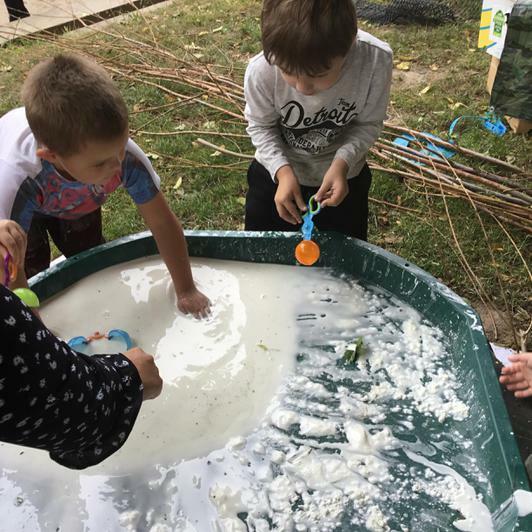 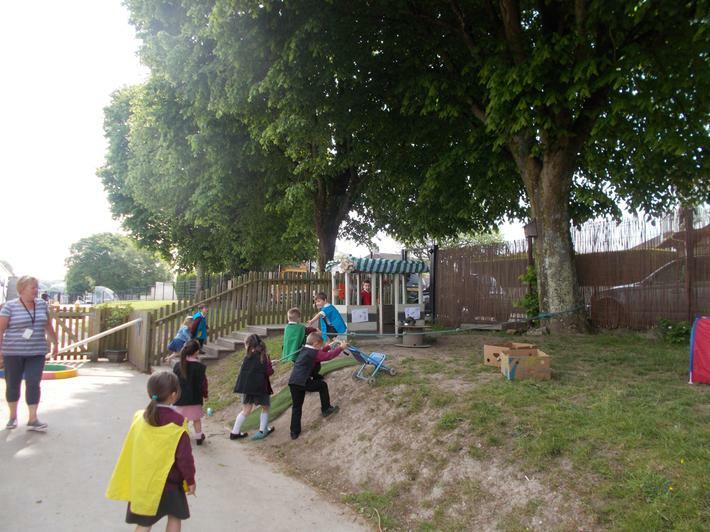 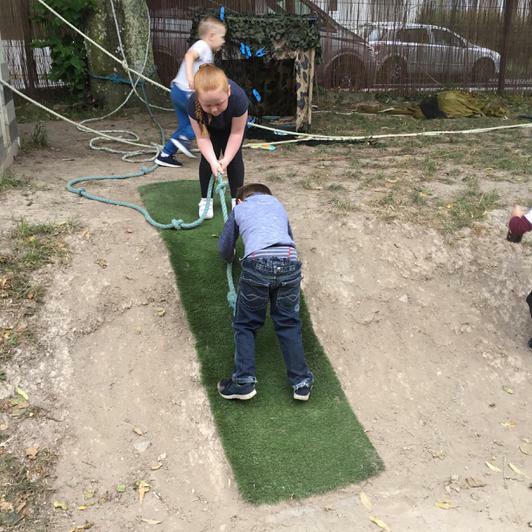 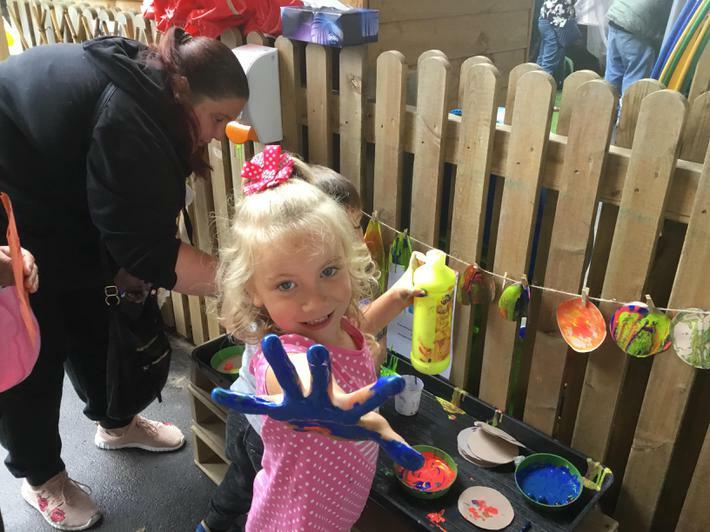 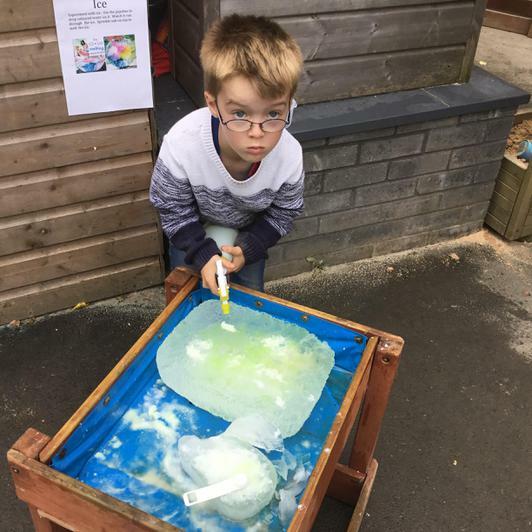 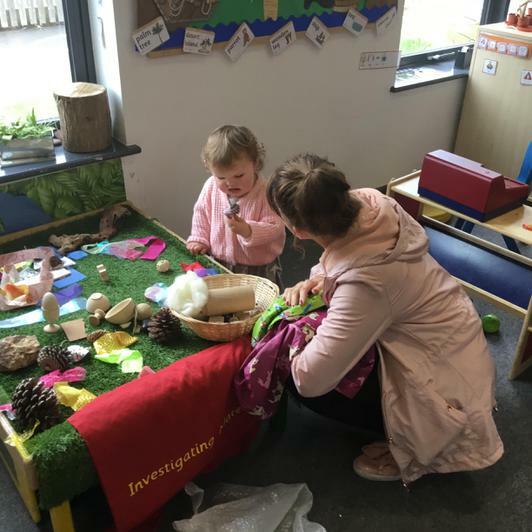 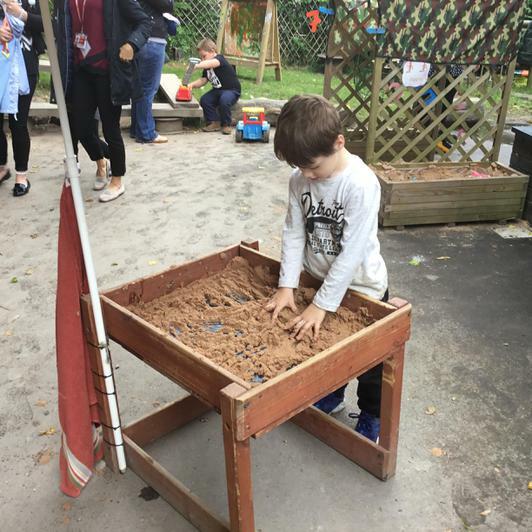 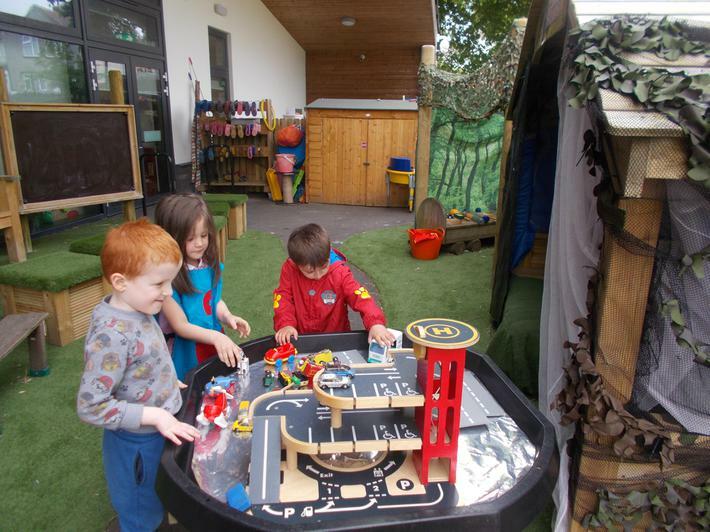 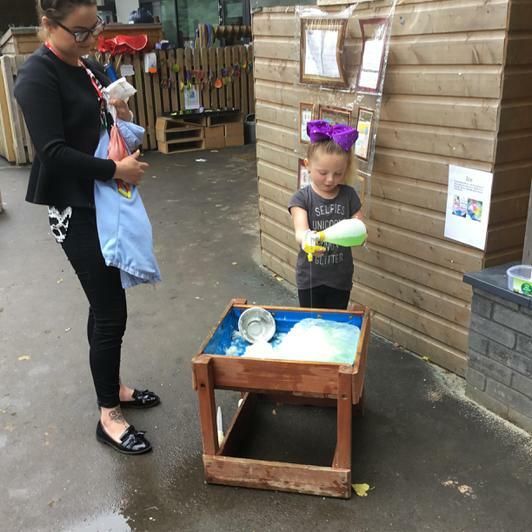 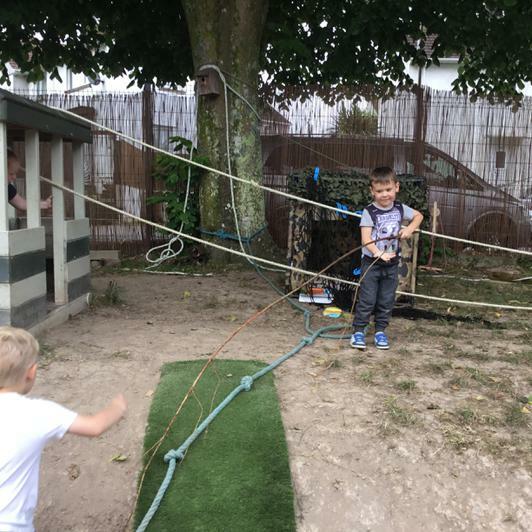 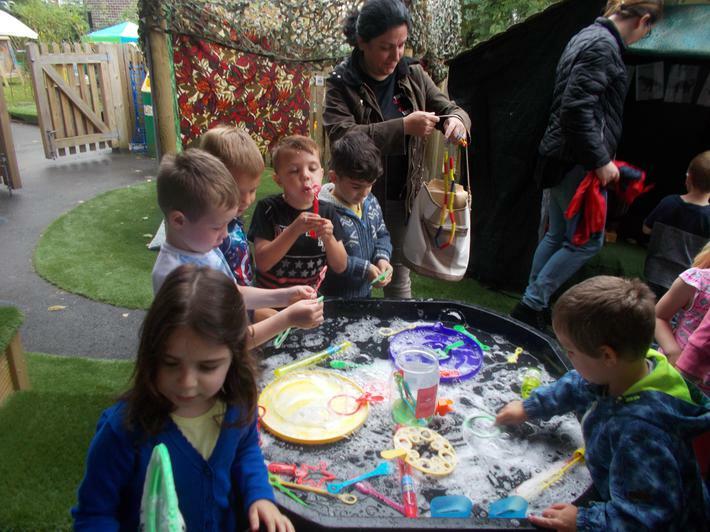 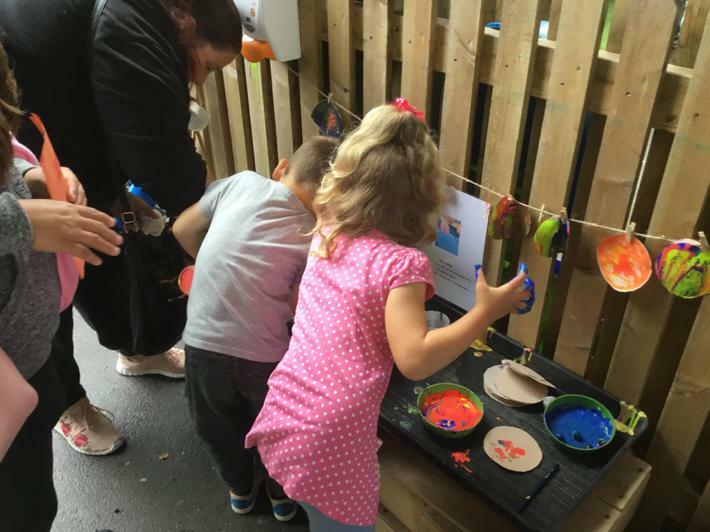 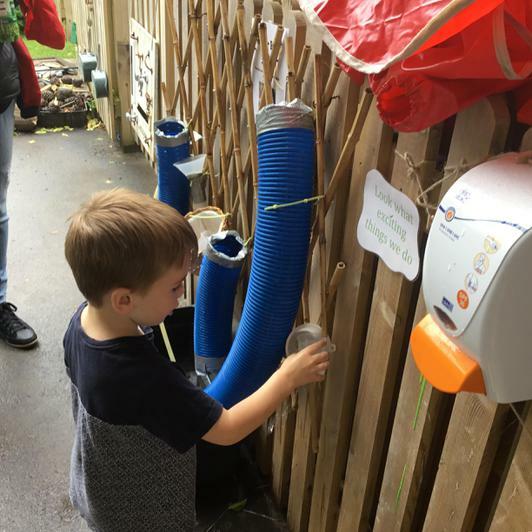 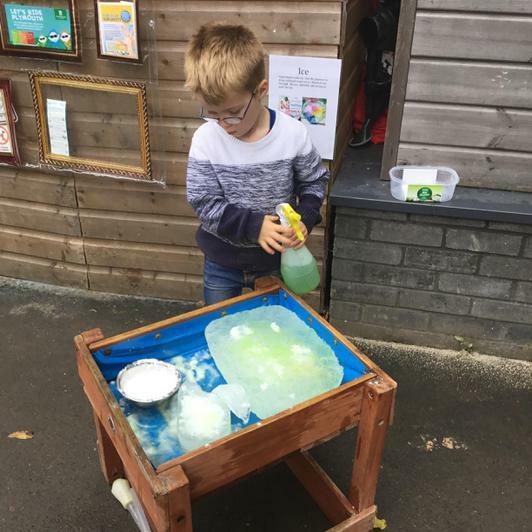 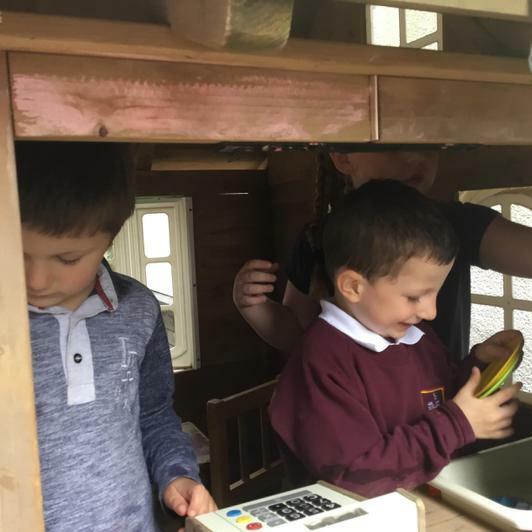 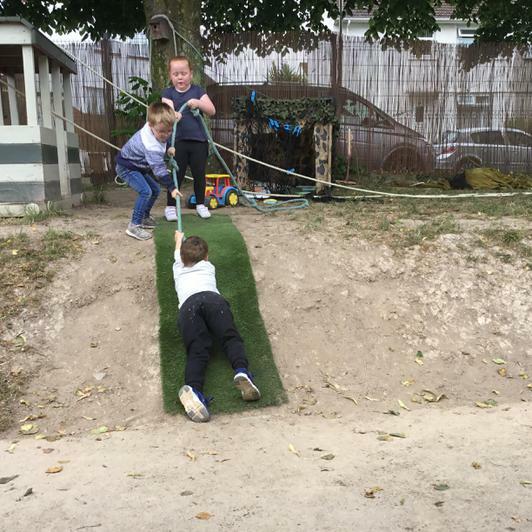 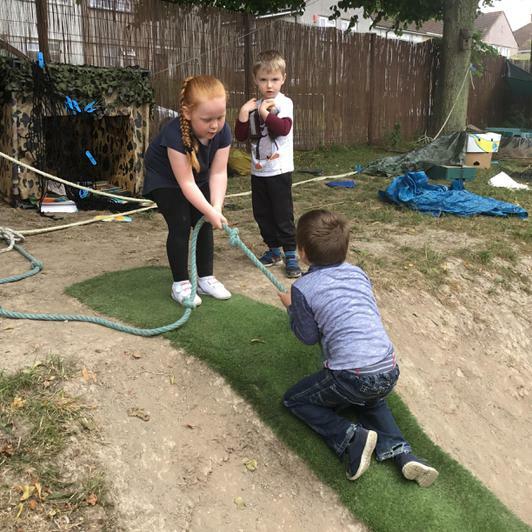 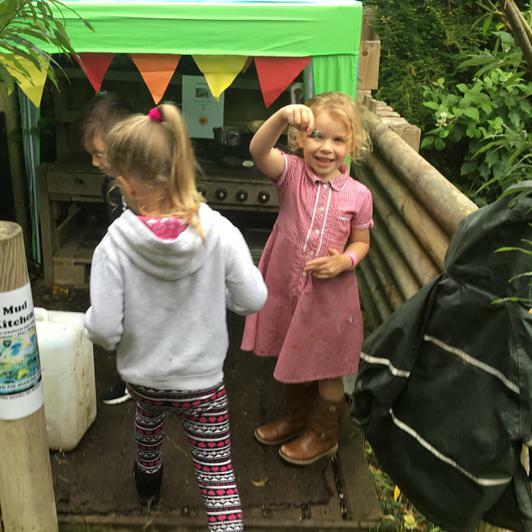 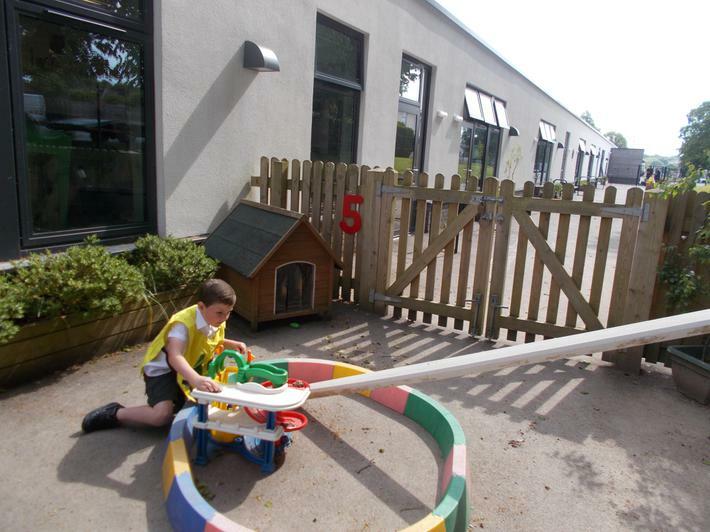 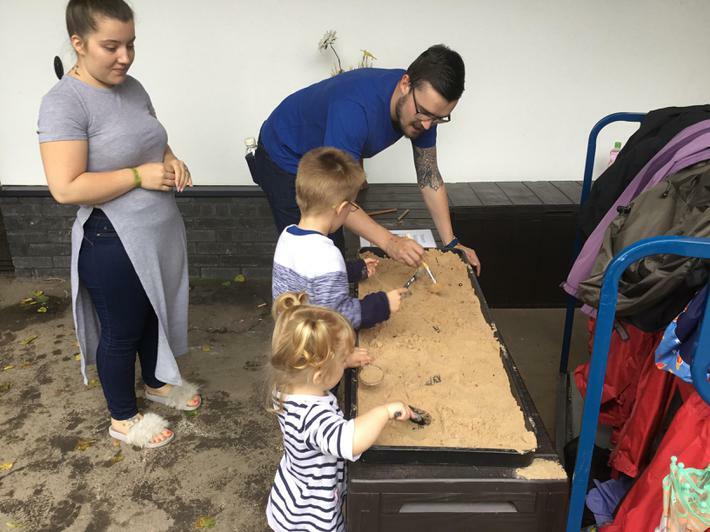 Every Monday and Wednesday the children will have the opportunity to use our outside environment helping their transition to our EYFS in September. 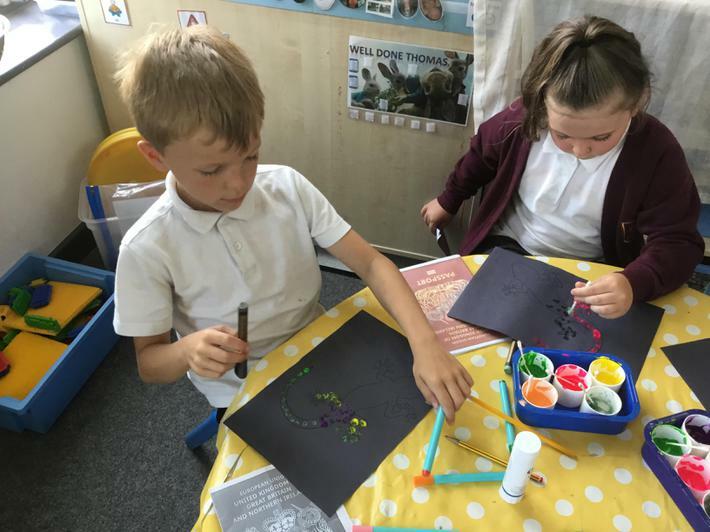 After School Club is now running and there are still spaces. 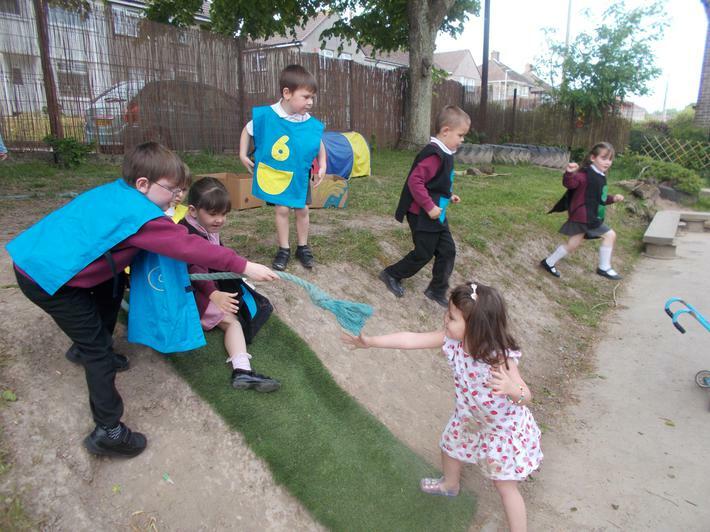 We've loved our bear hunt. 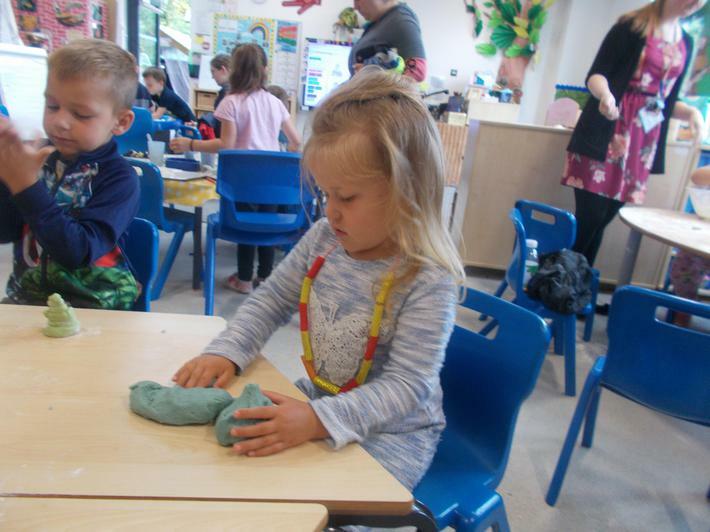 We found lots of lovely bears. 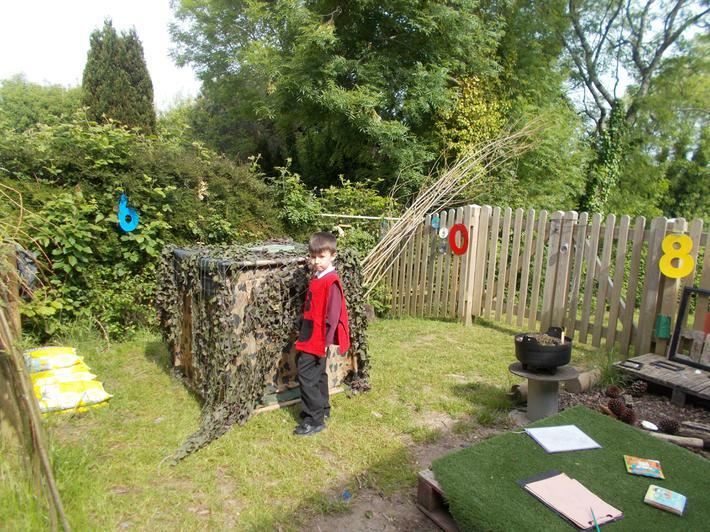 Some had really good hiding places! 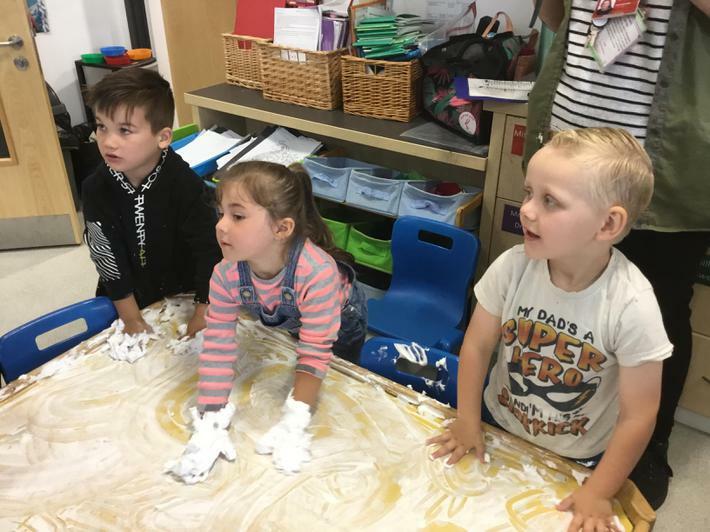 Can you count these things? 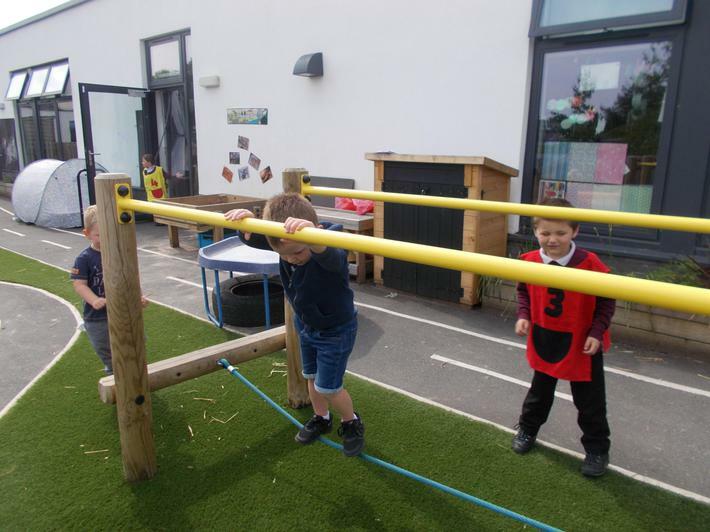 Nursery Rhyme Challenge There are links on this website to many of the songs in our challenge. 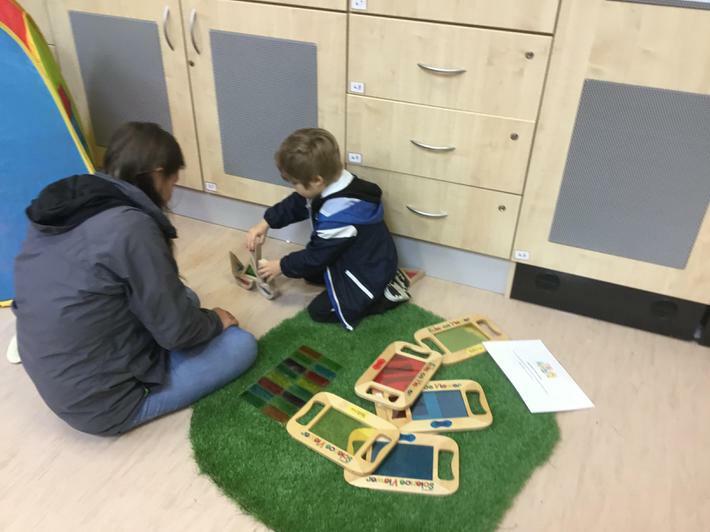 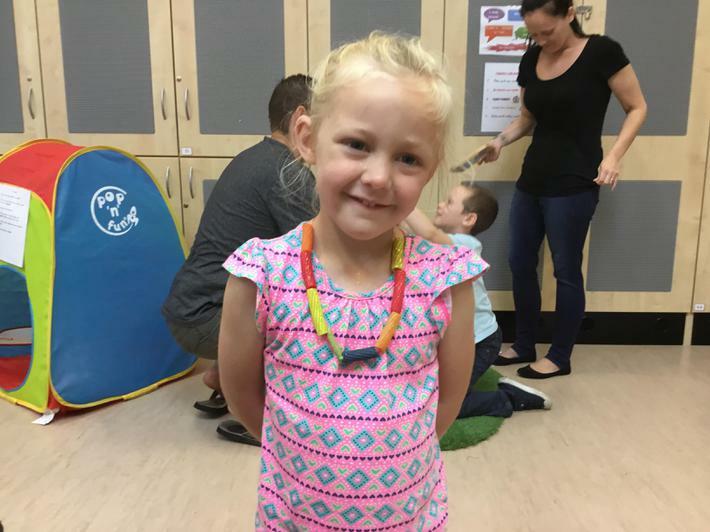 The children have enjoyed sharing them at school - if your child has completed the school challenge see if you can choose some new songs to learn and share with us. 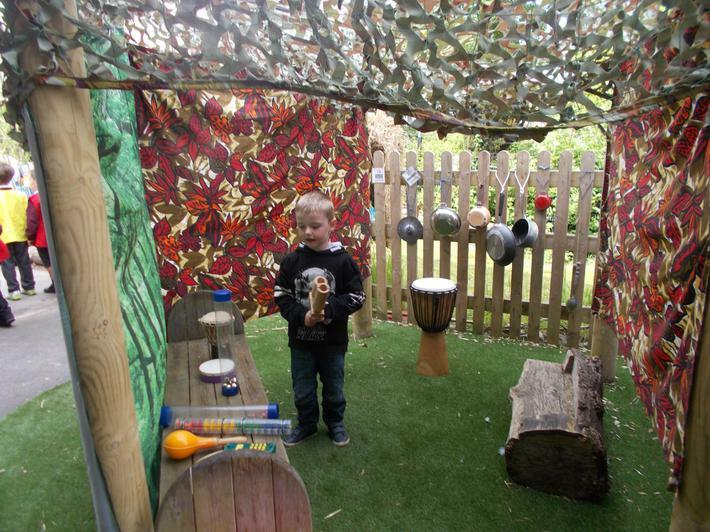 Gruffalo website Lots of games and activities linked to our story - explore and have fun!